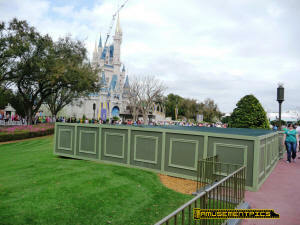 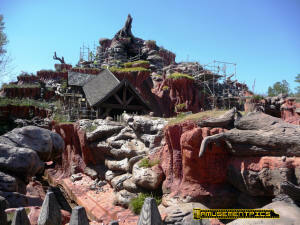 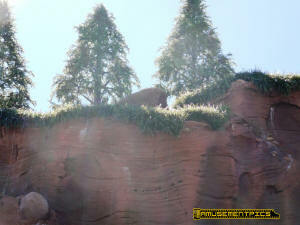 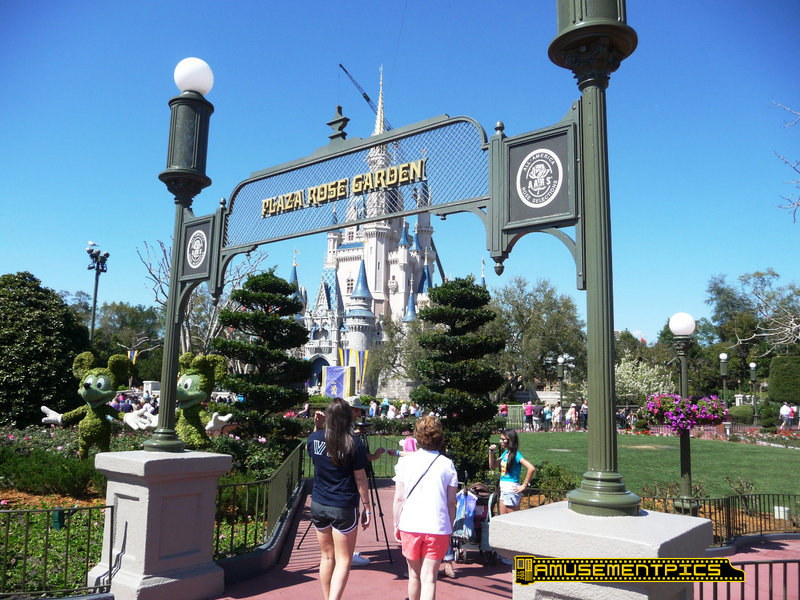 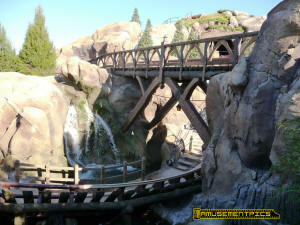 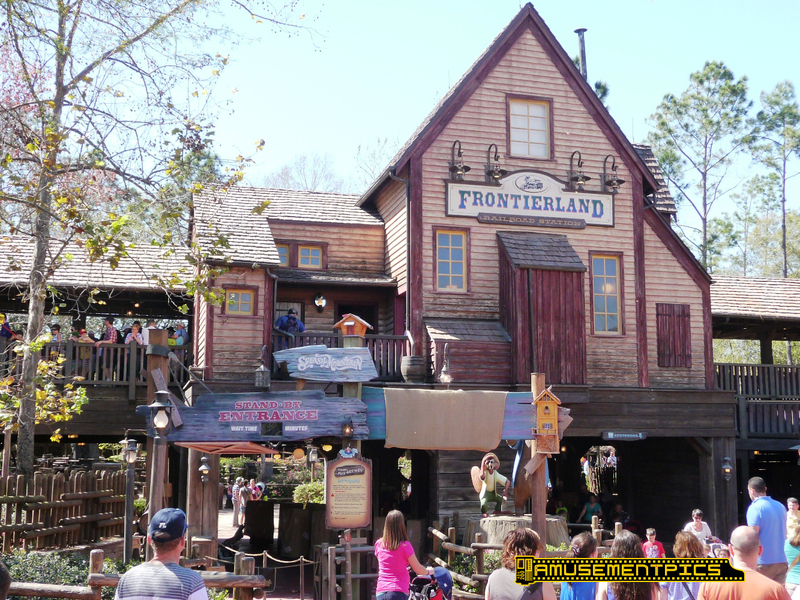 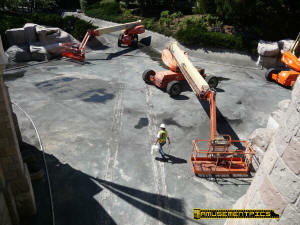 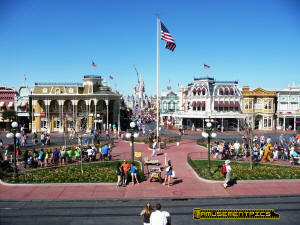 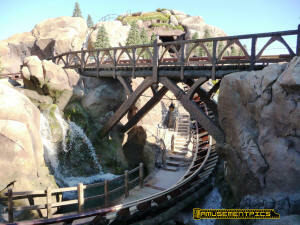 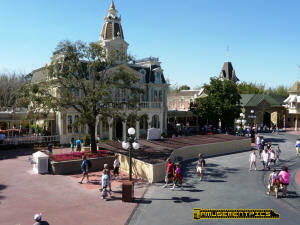 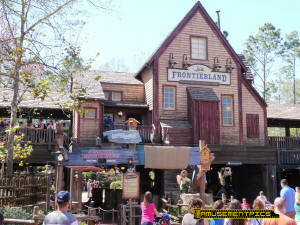 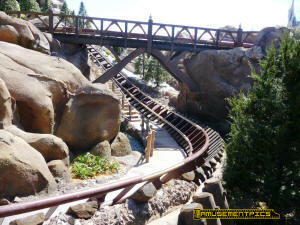 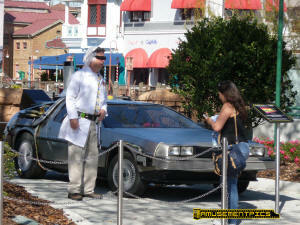 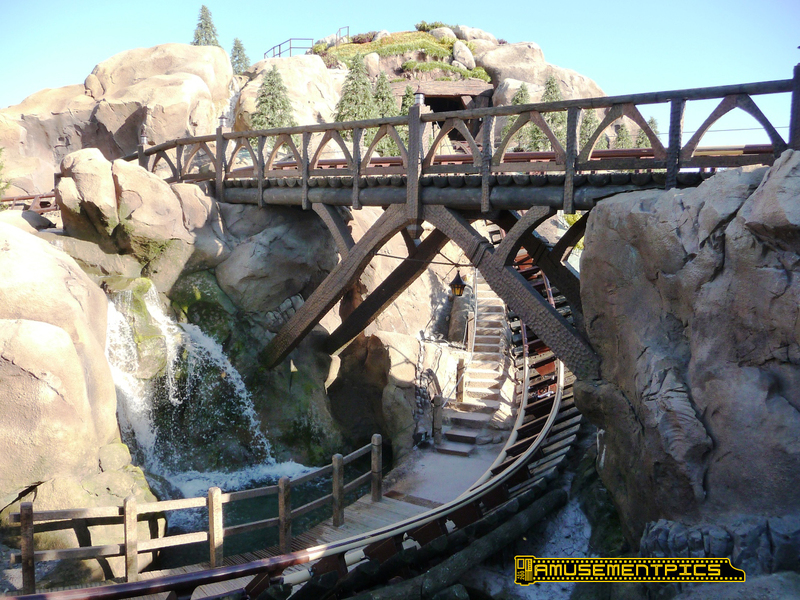 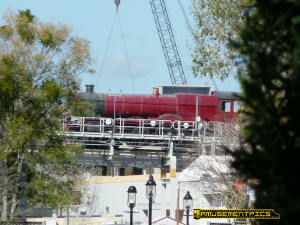 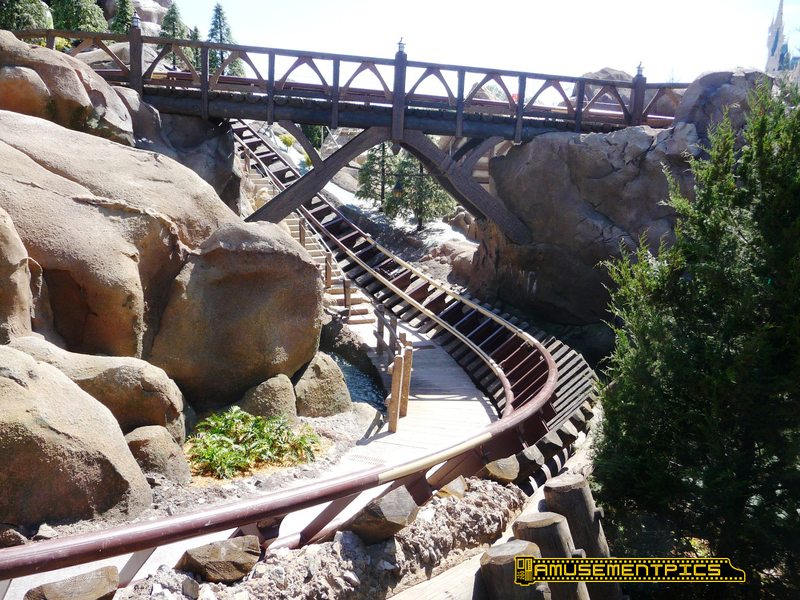 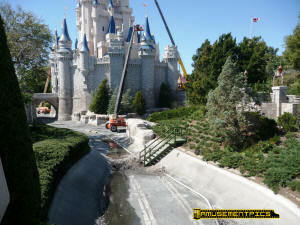 On February 24th, news leaked out of the new Magic Kingdom Hub bypass being built. 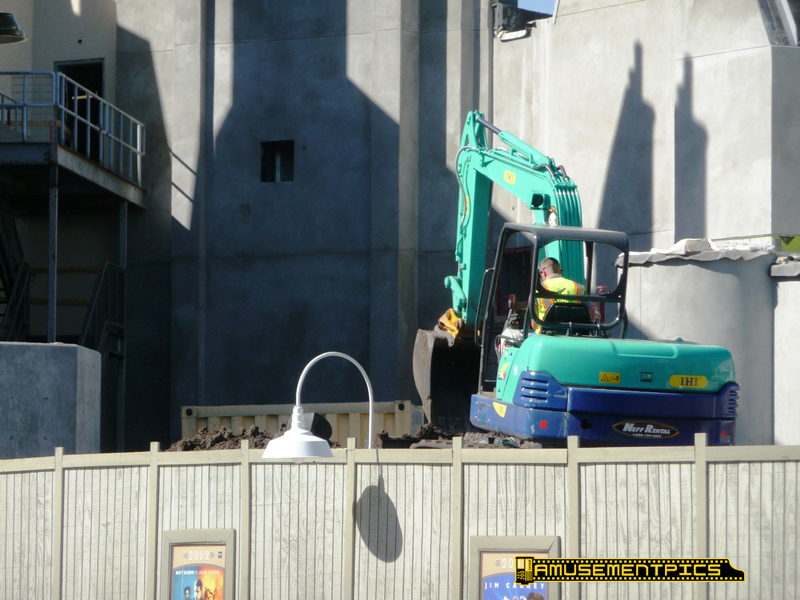 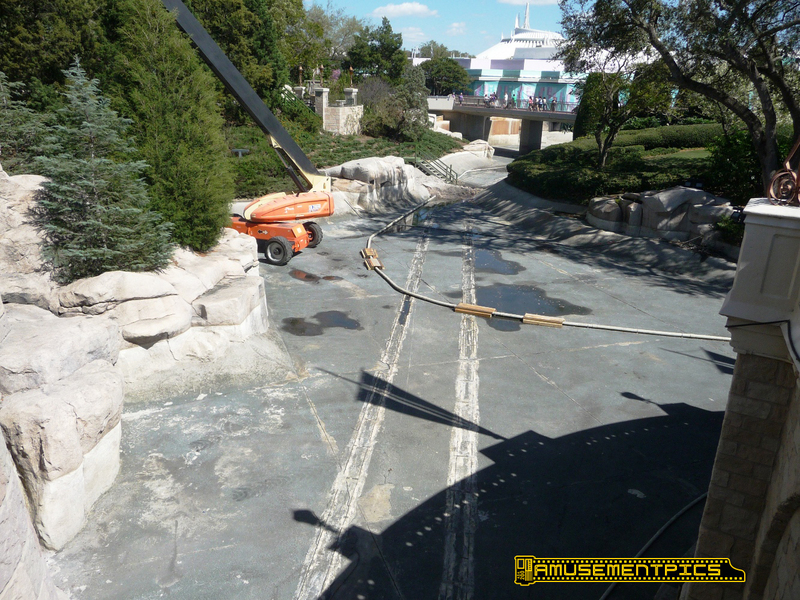 On that day (ahead of any official announcement), preparation had already started with water being pumped out of the old Swan Boat canals/Castle Moat. 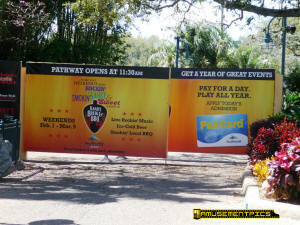 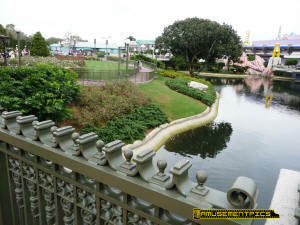 The new bypass will go from here over to where that small path joins the pathway to Tomorrowland. 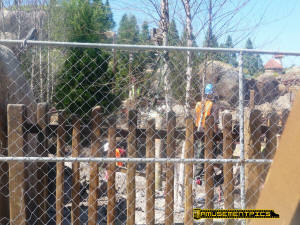 There's a big pump behind that fence hard at work draining the waterway. 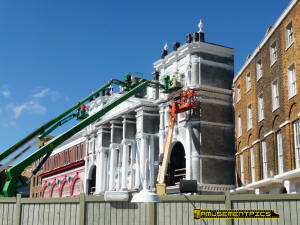 Another look at the pump enclosure. 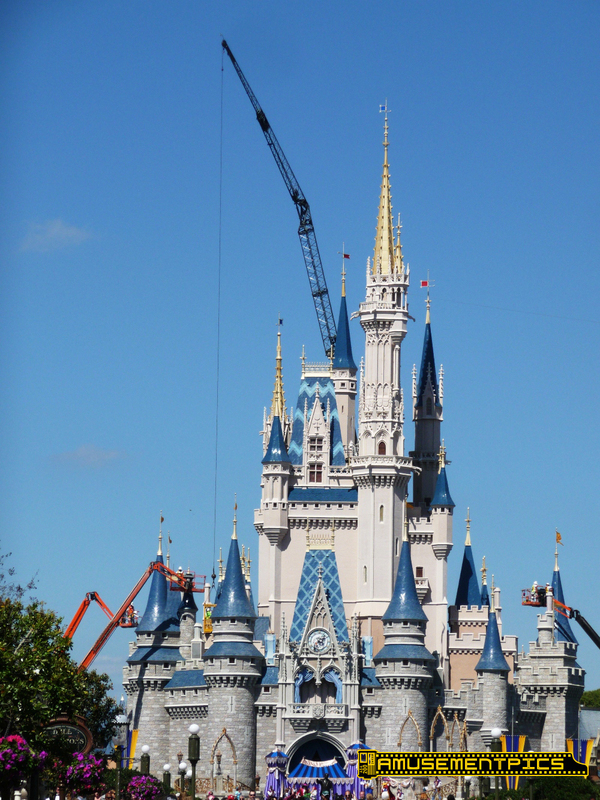 Last day for this view. 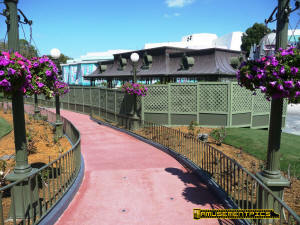 The new path will go from here to where those umbrellas are on the pathway. 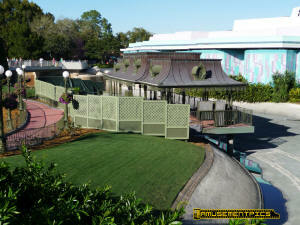 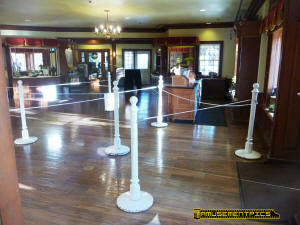 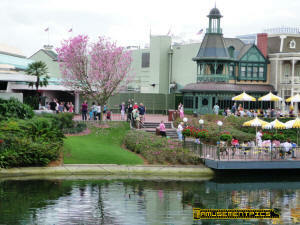 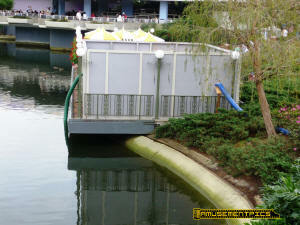 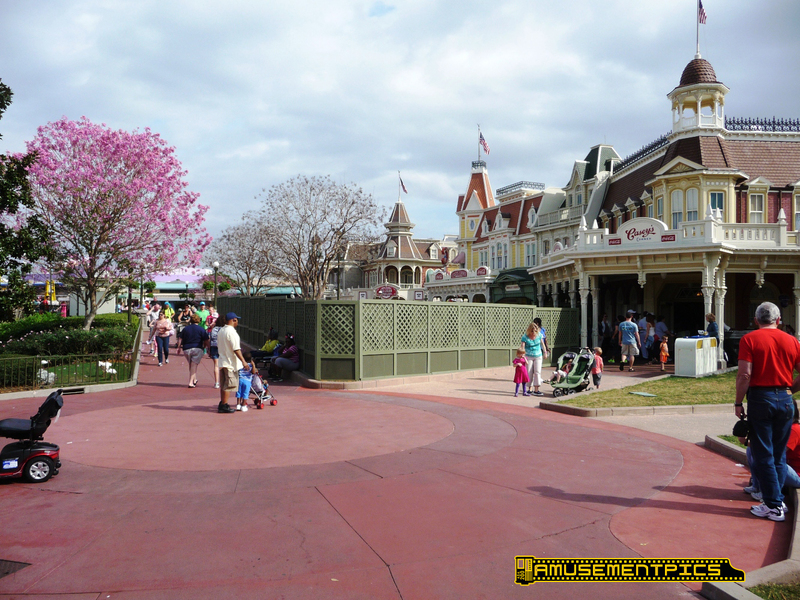 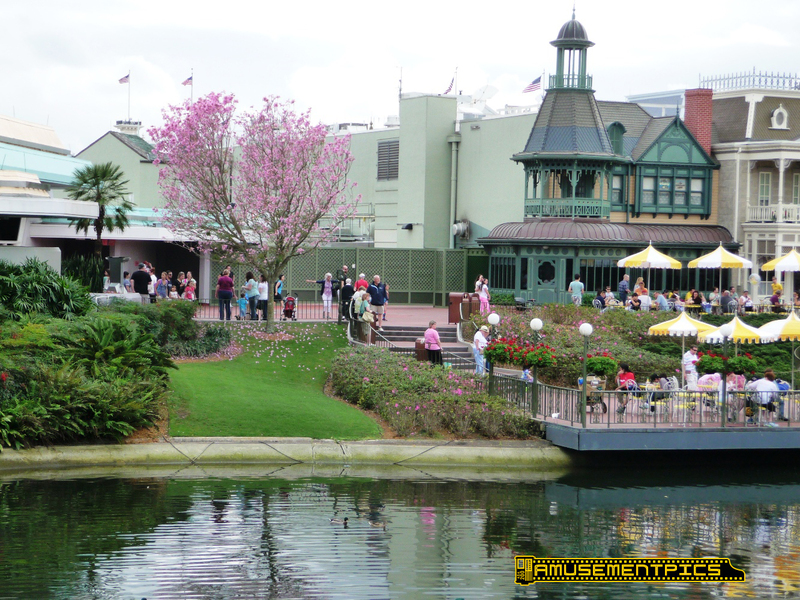 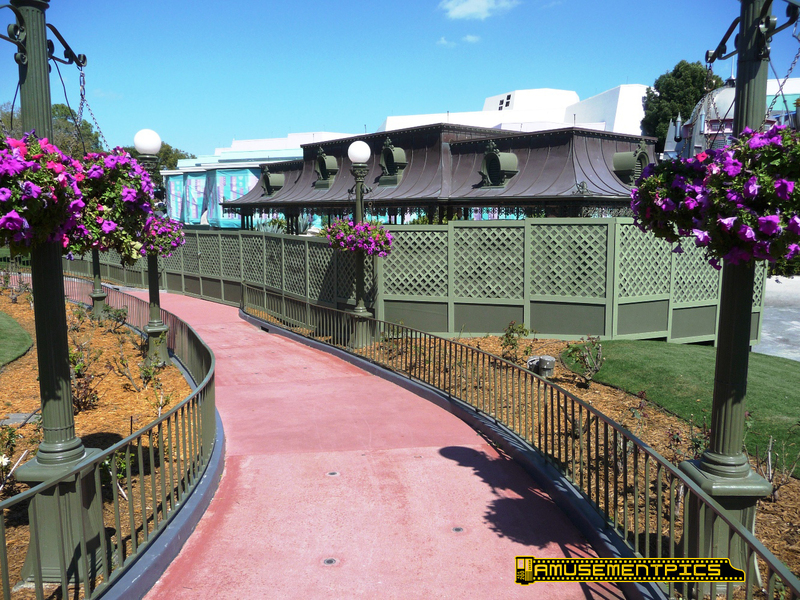 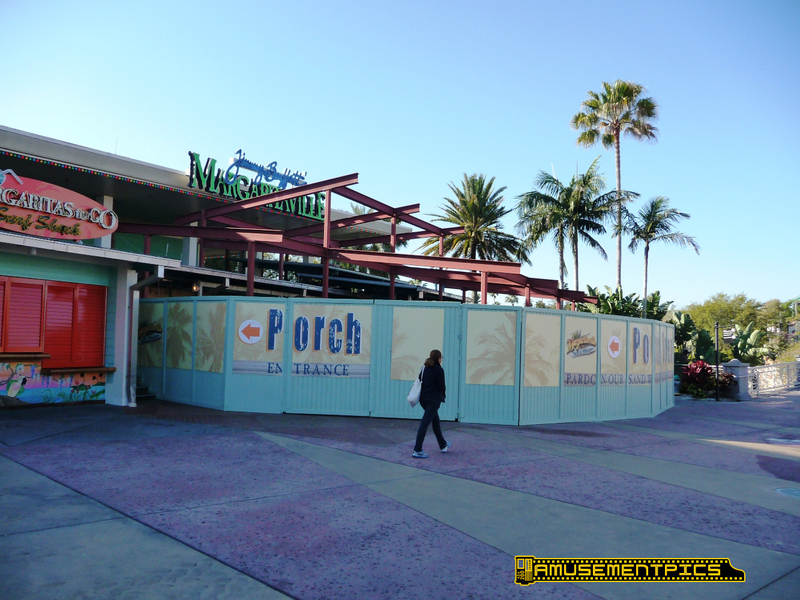 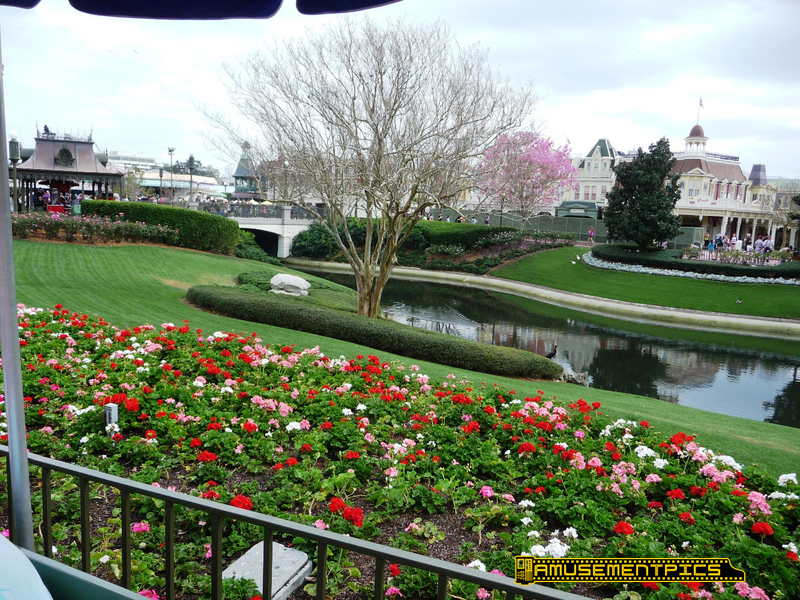 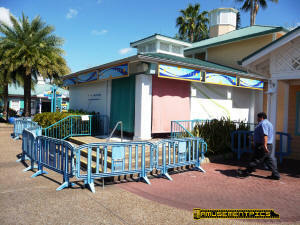 The old Swan Boat Landing will be going away with this remodel. The path will go from here to the Main Street bridge. That lower seating area will go away as the area gets leveled. The new backstage bypass will go through the green gates over here. 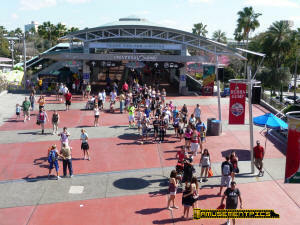 outer ring of the hub will soon be built. 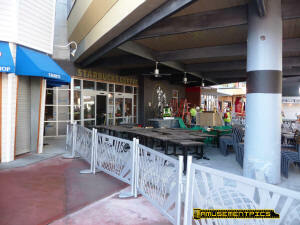 Still working on the Casey's patio which will be expanded. 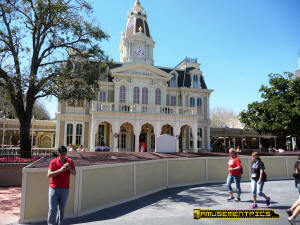 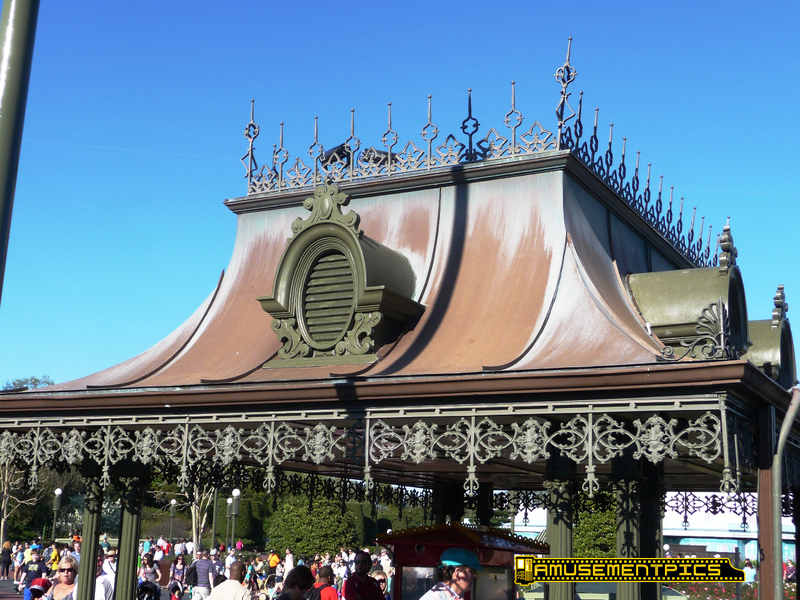 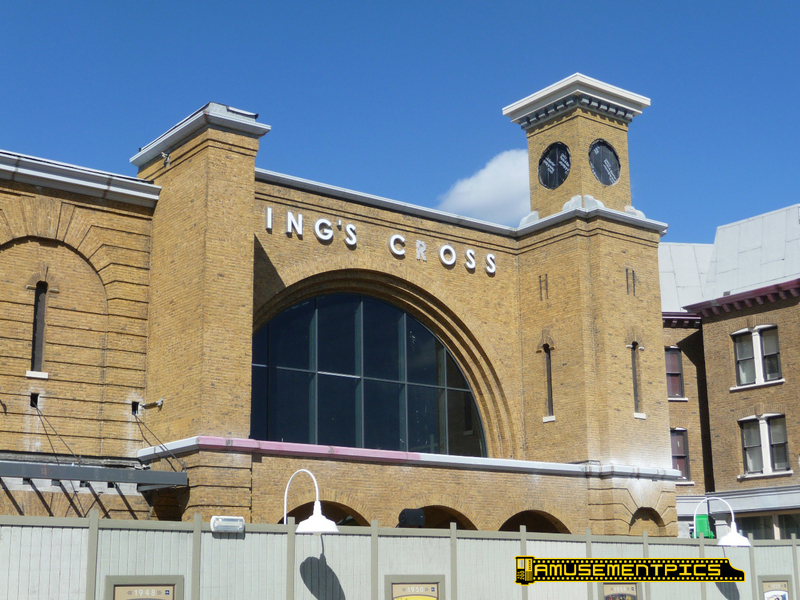 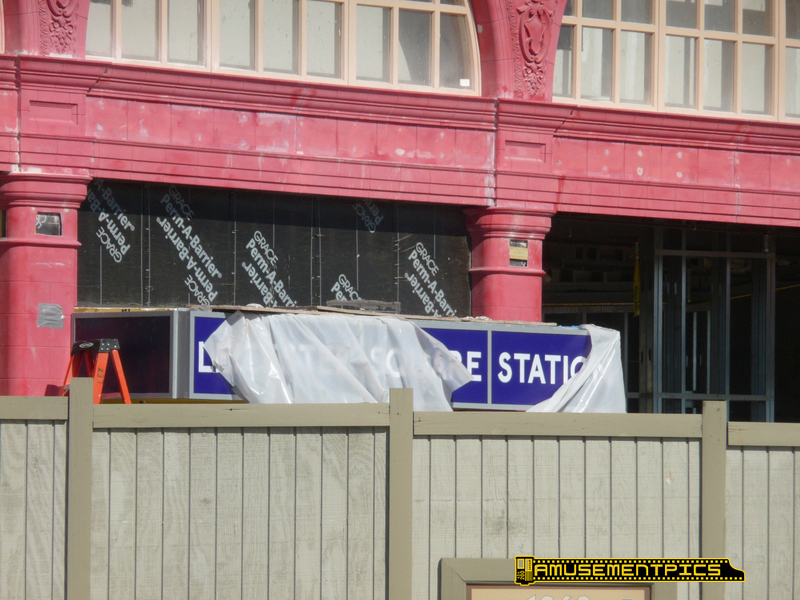 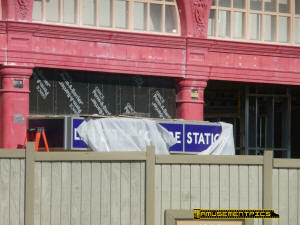 These little Victorian style structures look like they are going away as part of the reimagined Hub. Just a big puddle of mud left behind once the water was drained. 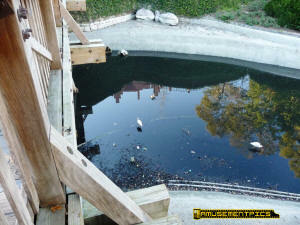 The pump is gone from the patio. 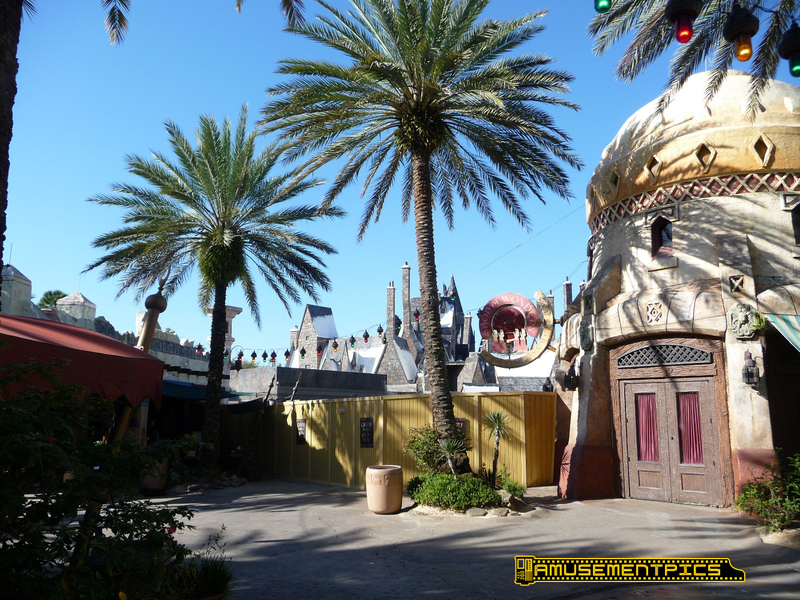 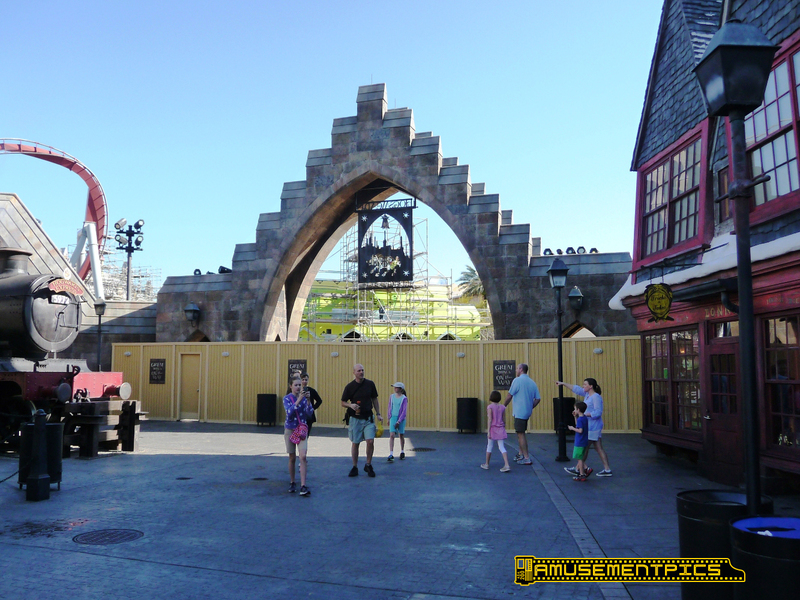 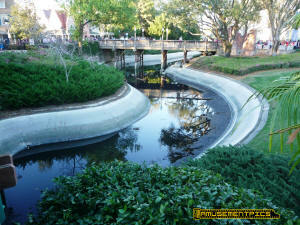 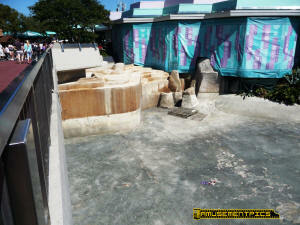 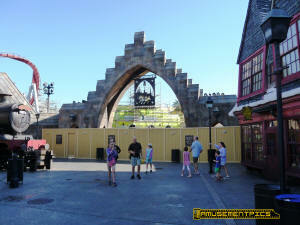 Just a few days after the announcement the waterways had been mostly drained and more prep work is starting all around the Hub. 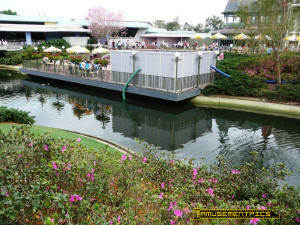 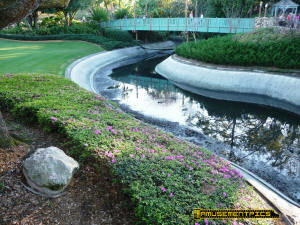 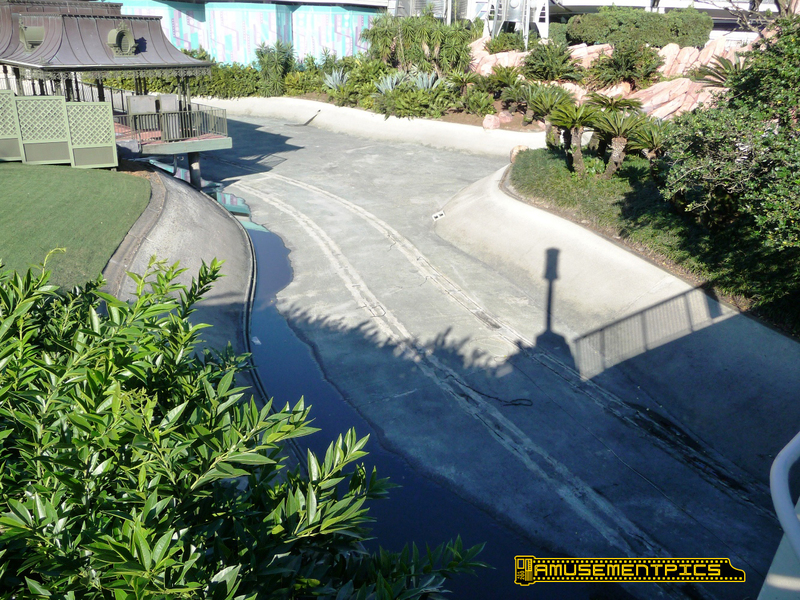 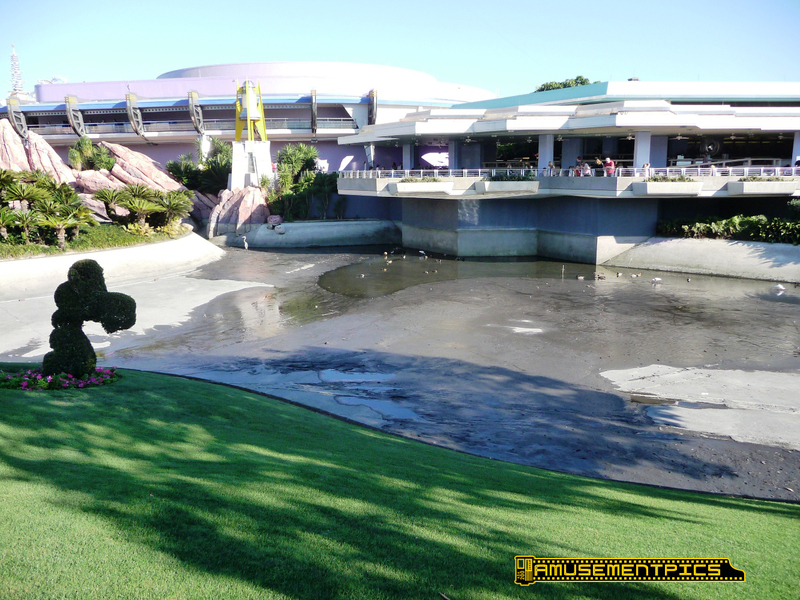 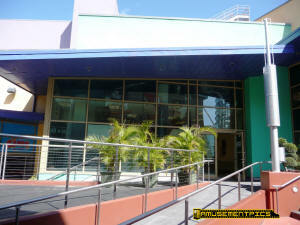 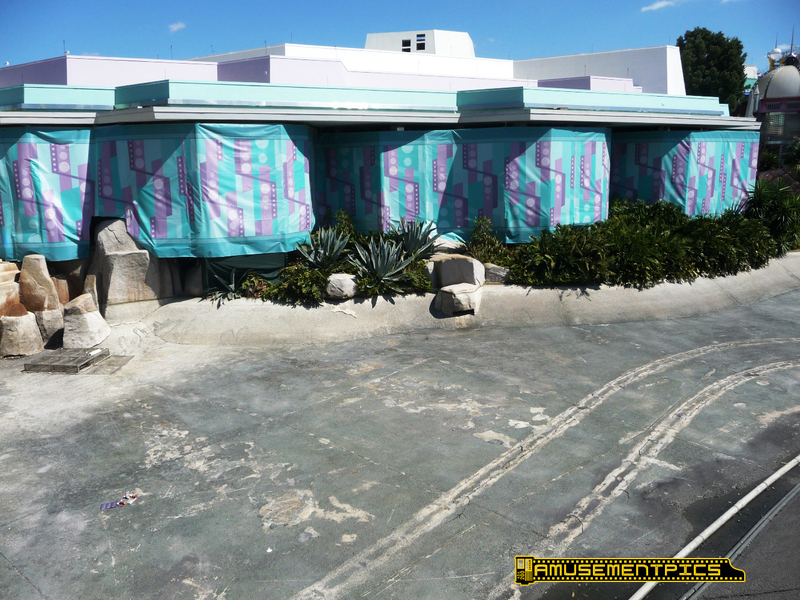 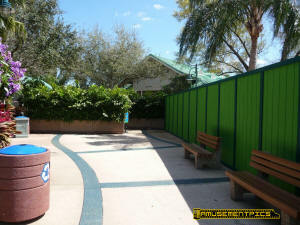 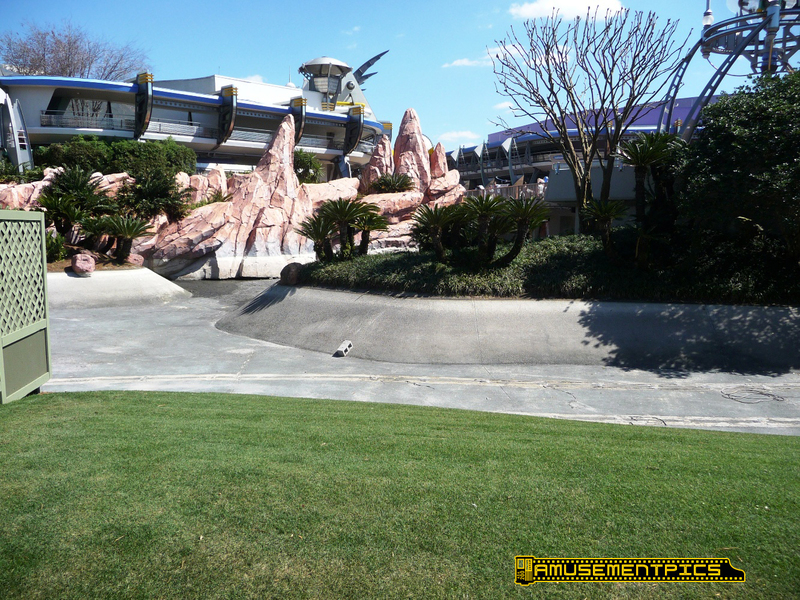 A little puddle left in front of Tomorrowland Terrace. 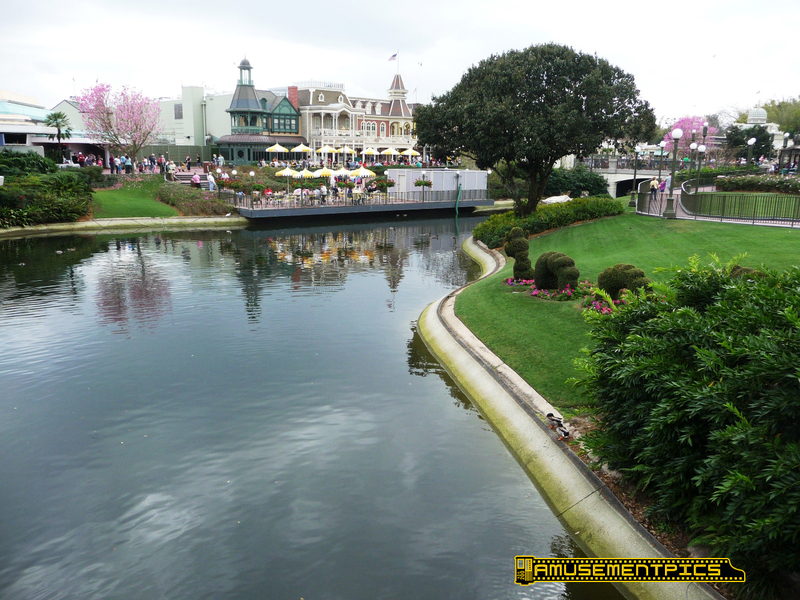 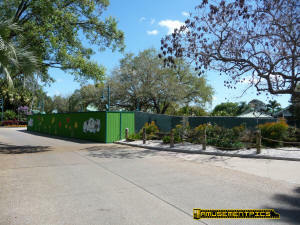 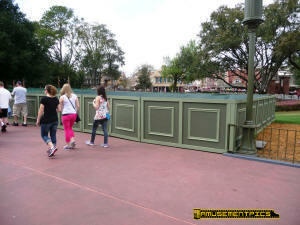 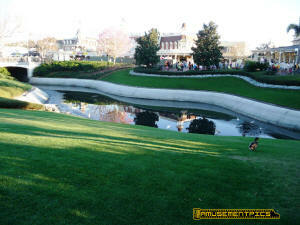 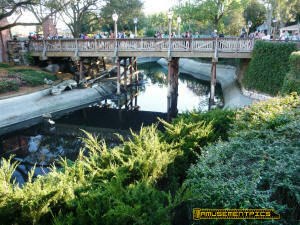 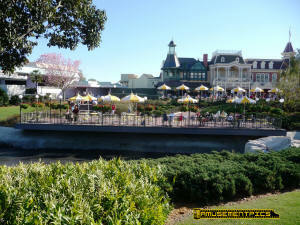 The Swan Boat Landing has been walled off in preparation. 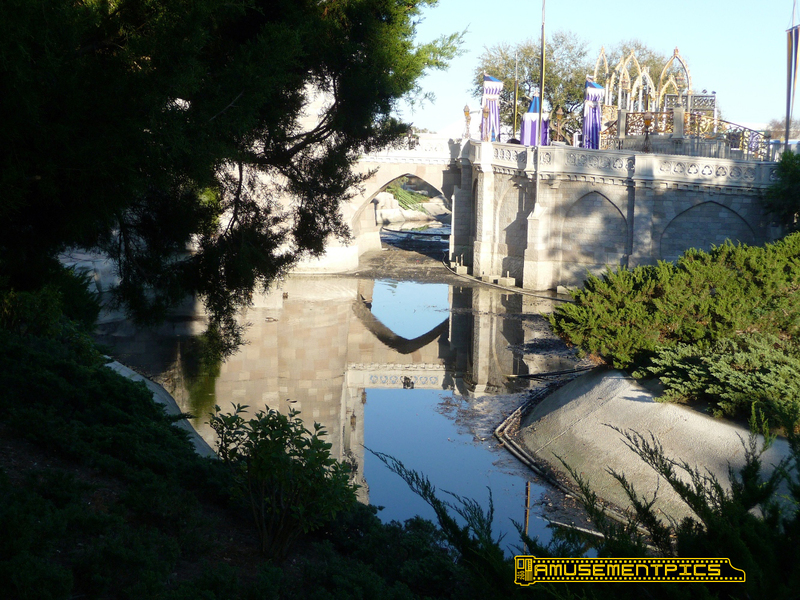 Still some standing water in front of the Castle and over on the Liberty Square side of the Hub. 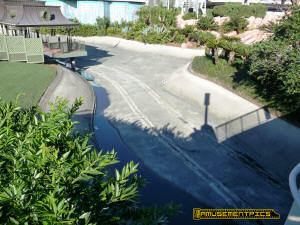 The water is still going down slowly but surely. 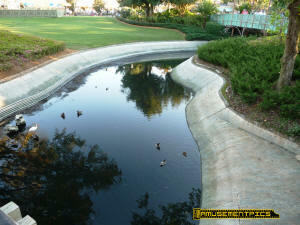 I would guess this side of the waterway is slightly lower than the other side. 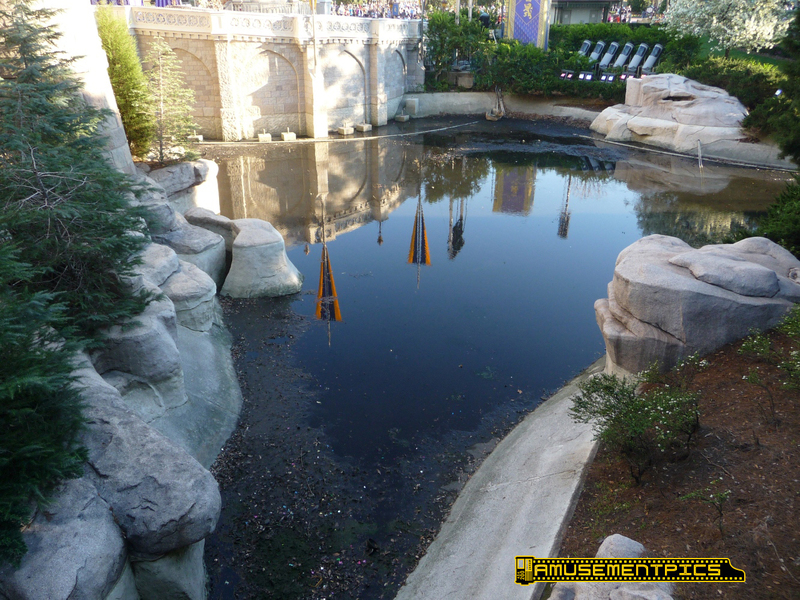 Over where it connects to Adventureland there is a LOT of conduit normally hidden below the water. 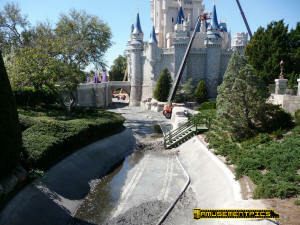 working on the pavement, maybe removing the curbs? 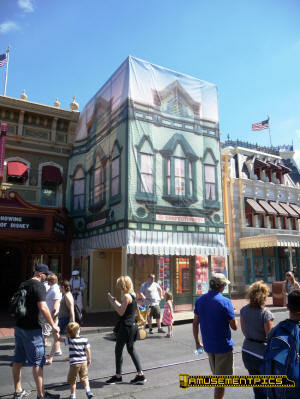 Rehab on part of the Cady Shop. 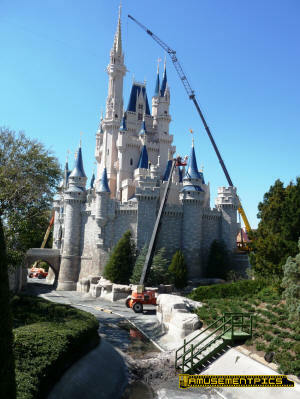 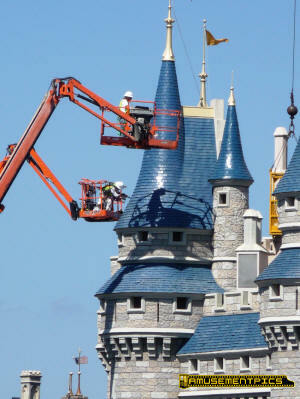 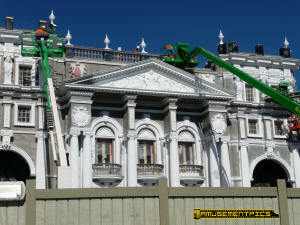 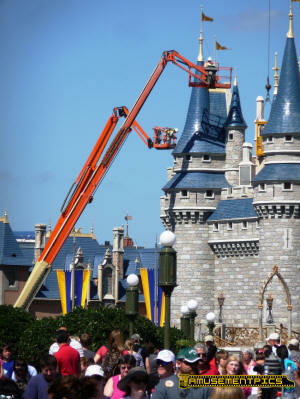 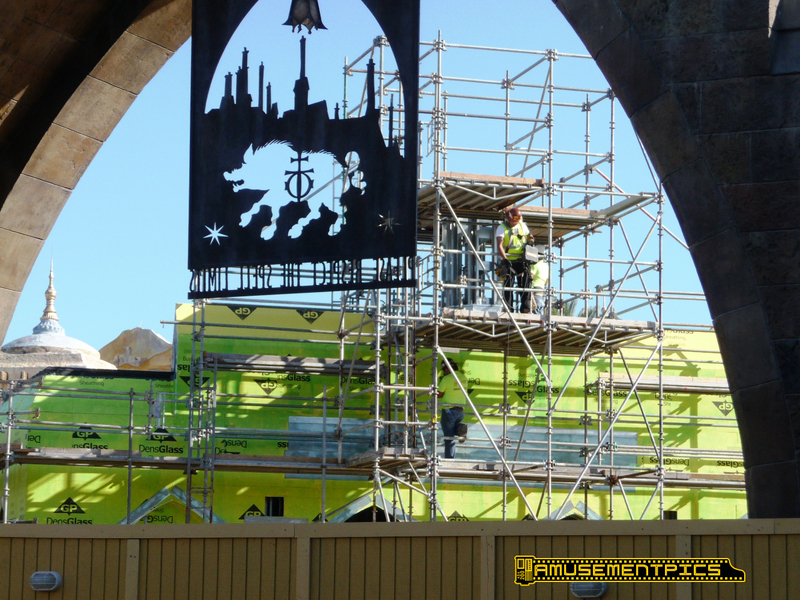 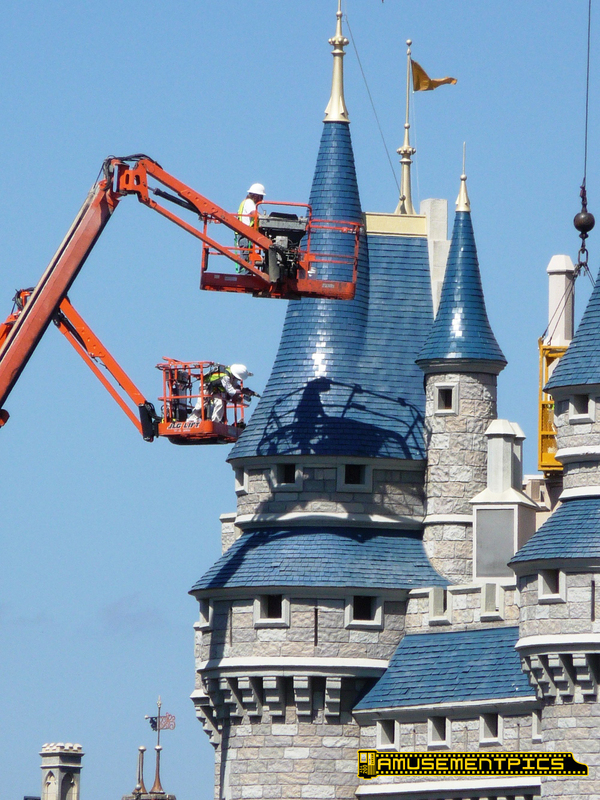 After removing the lights, the Castle rehab seem to be dragging on. vehicle access to the Castle to complete the rehab. 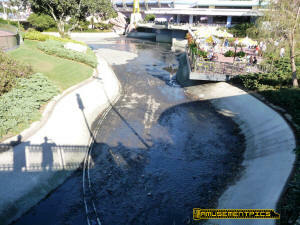 Just mud and trash now. 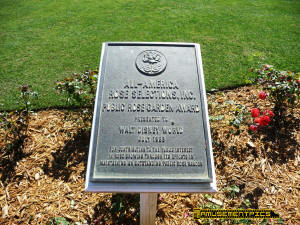 It will be sad to see the Rose Garden going away. 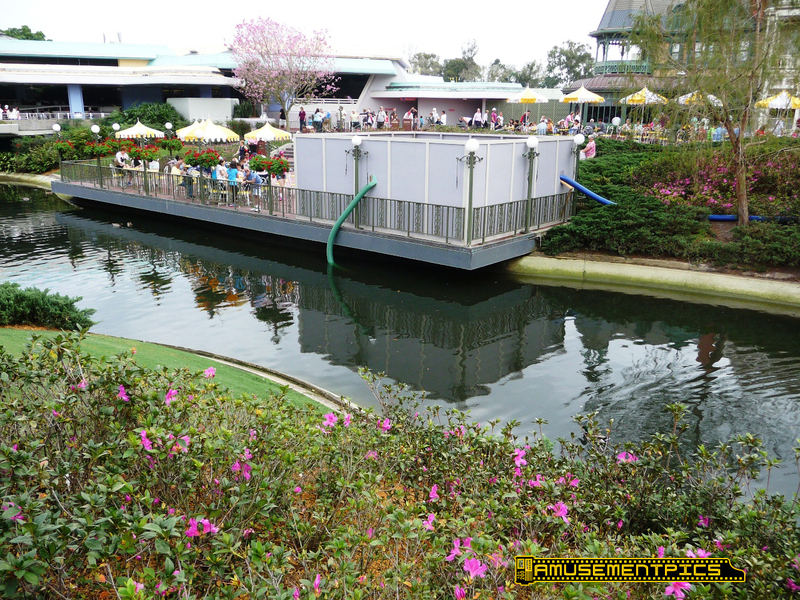 The closed off Swan Boat Landing. 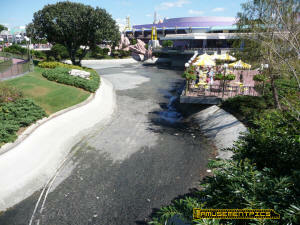 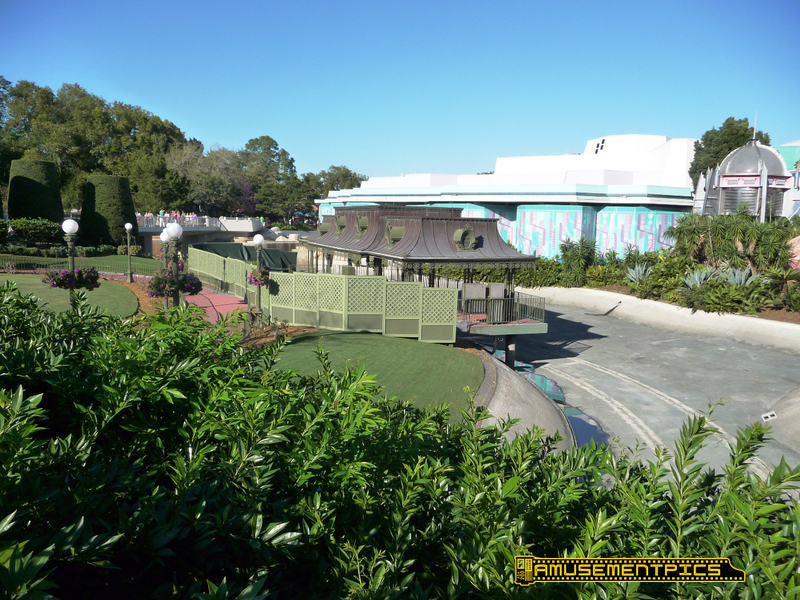 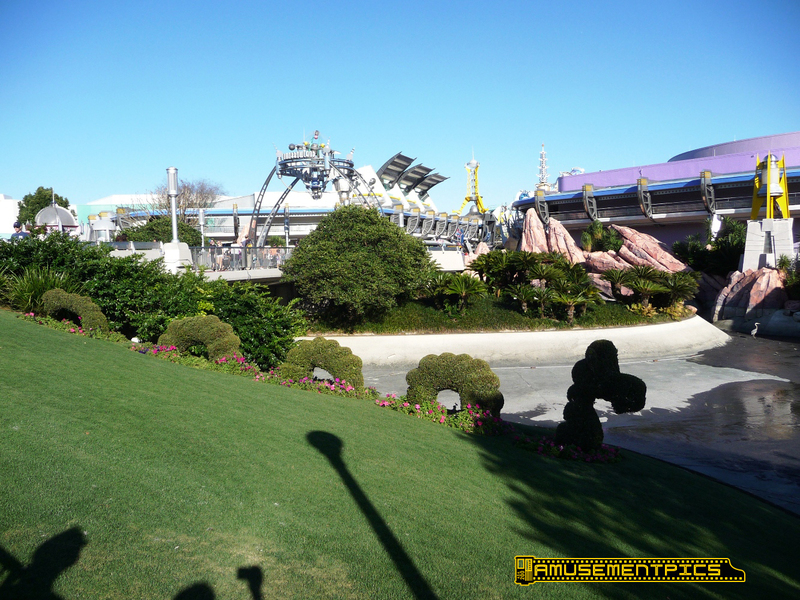 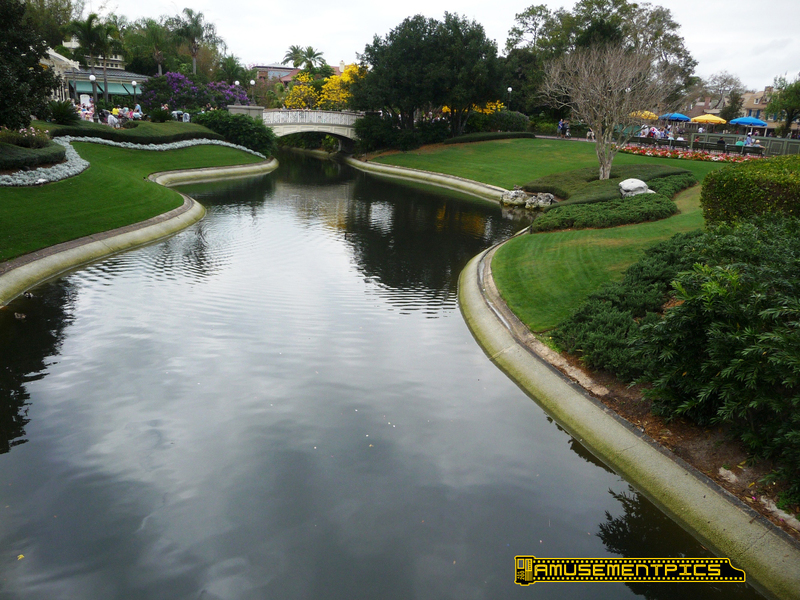 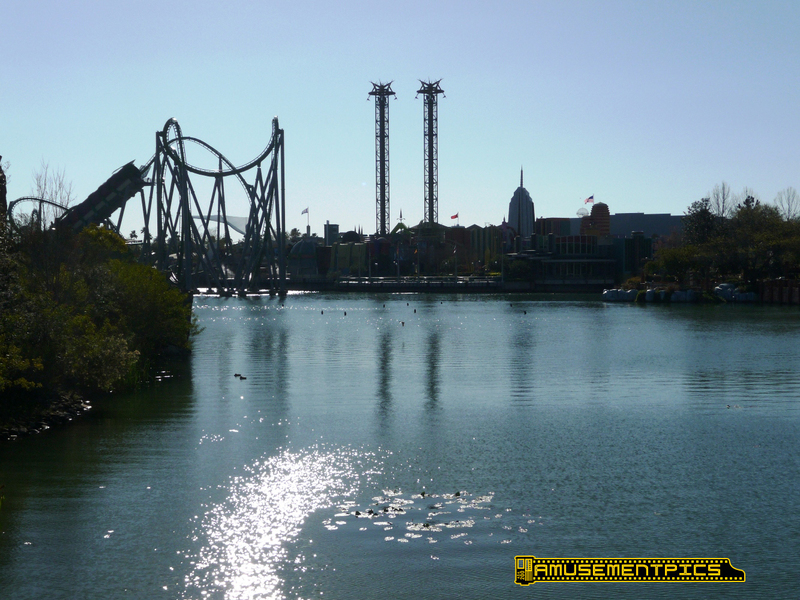 View of Tomorrowland without the water. Interesting to see there were two Swan Boat tracks. The (dry) waterfall. 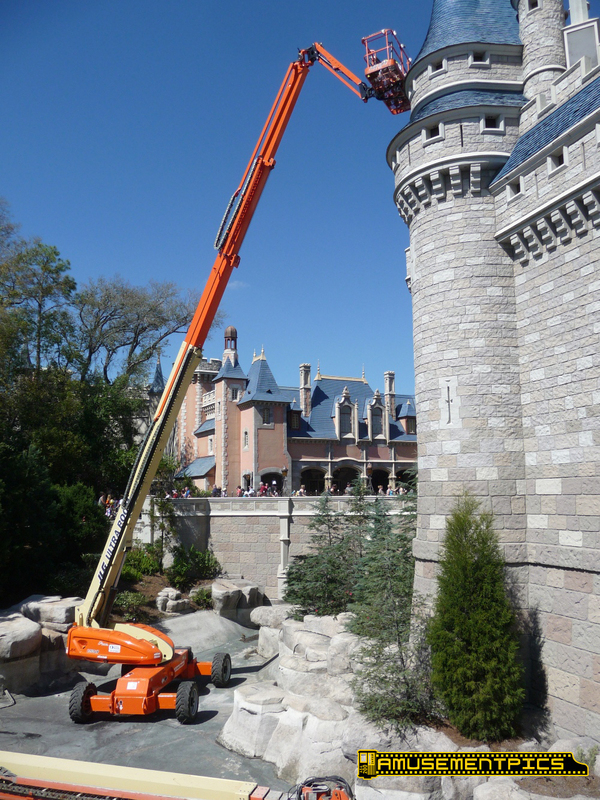 Temporary stairs for workmen to access the High Reach. 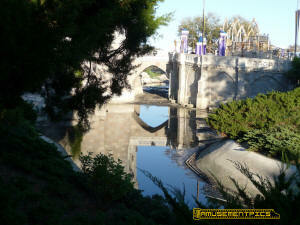 Looking down the moat. 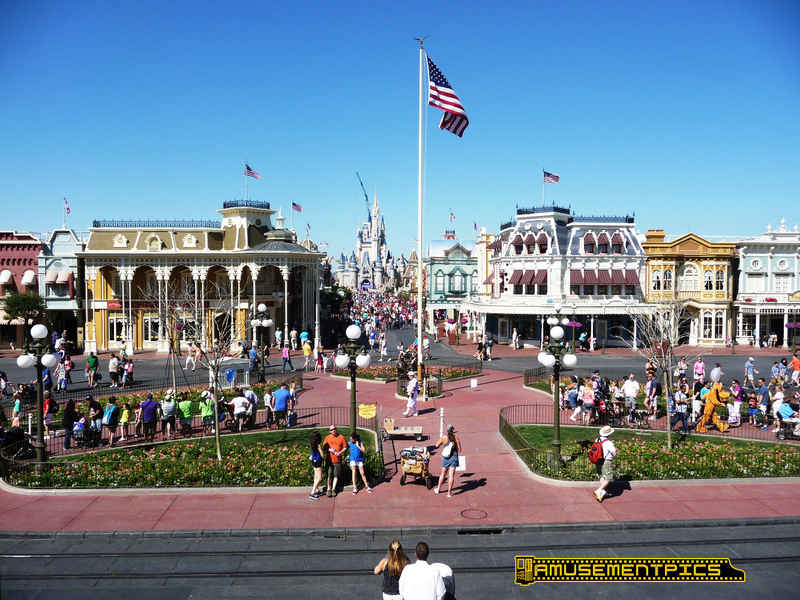 View the other direction. 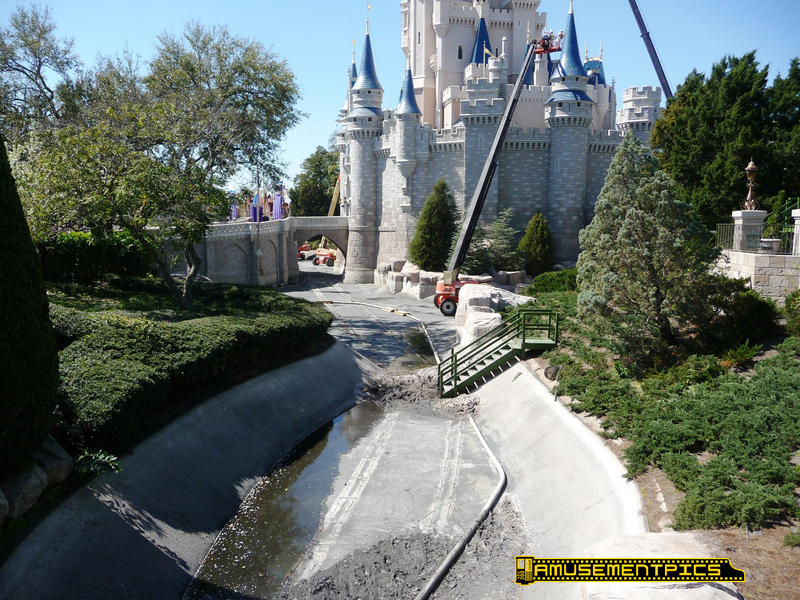 More High Reaches and once again evidence of two Swan Boat tracks. 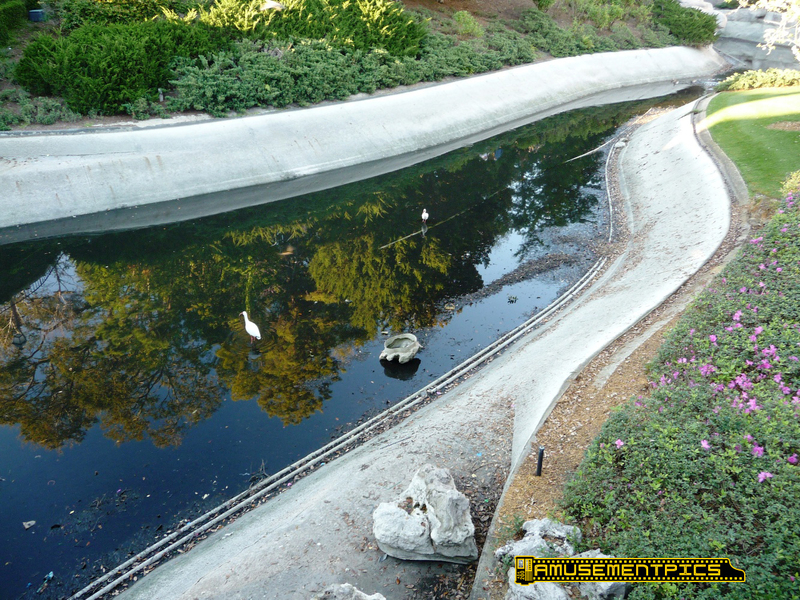 View down the waterway alongside the Crystal Palace. 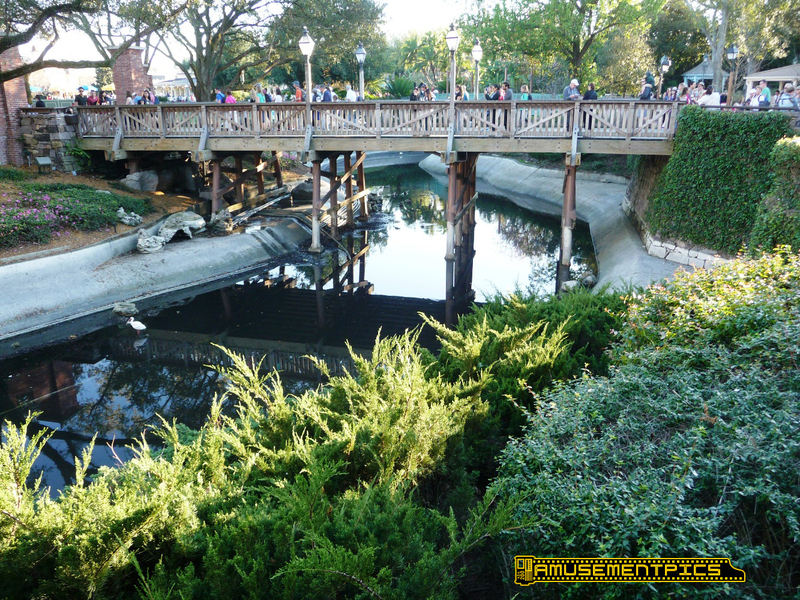 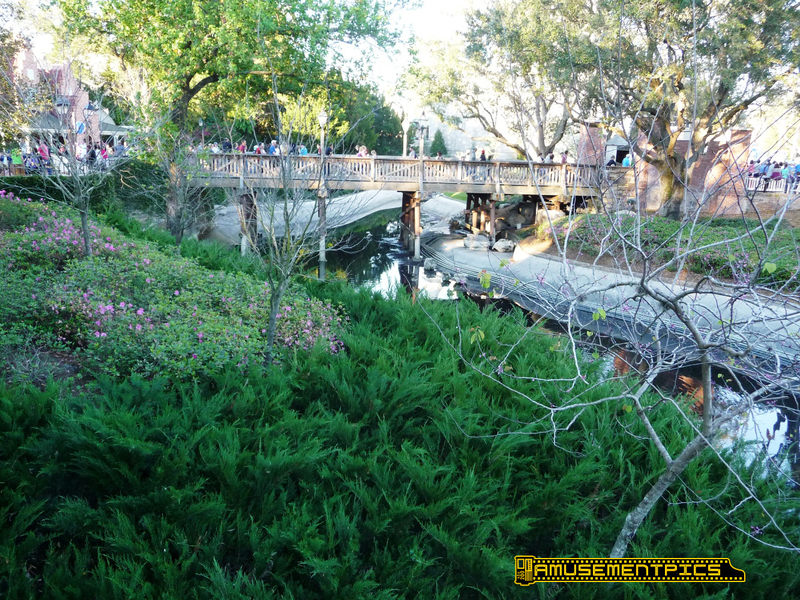 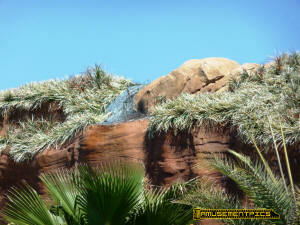 The dam holding the water for the Jungle Cruise is just beyond the trees. 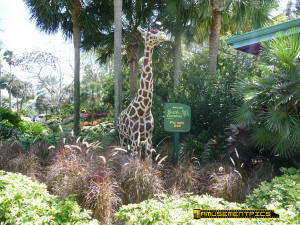 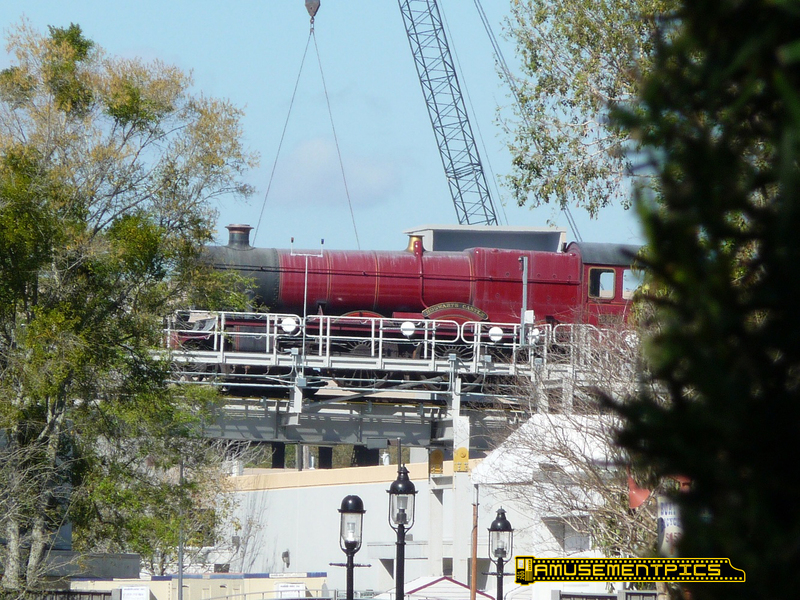 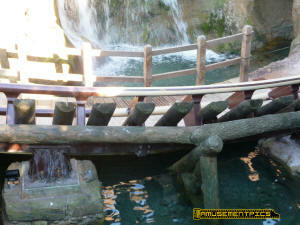 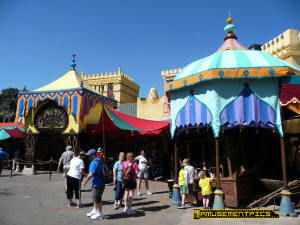 From Adventureland bridge. 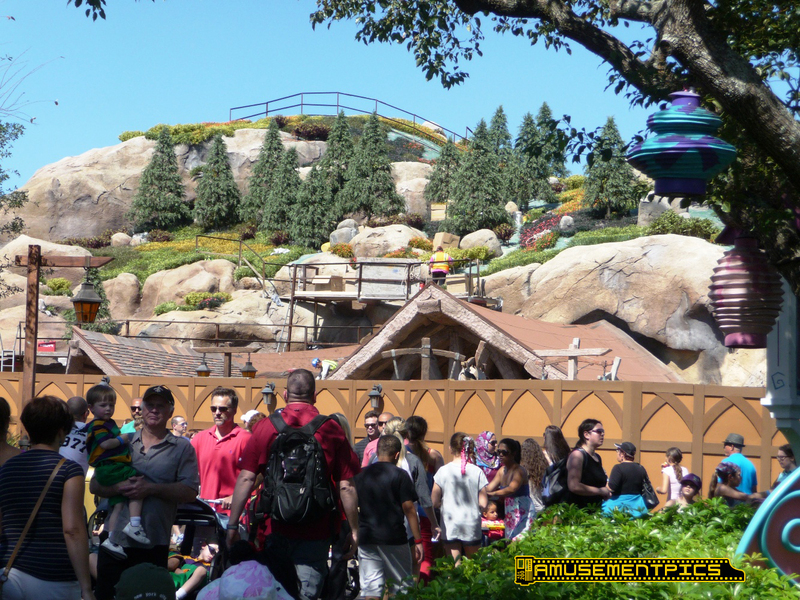 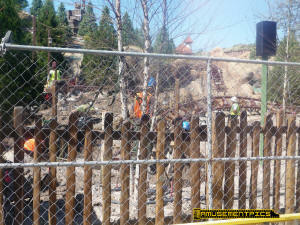 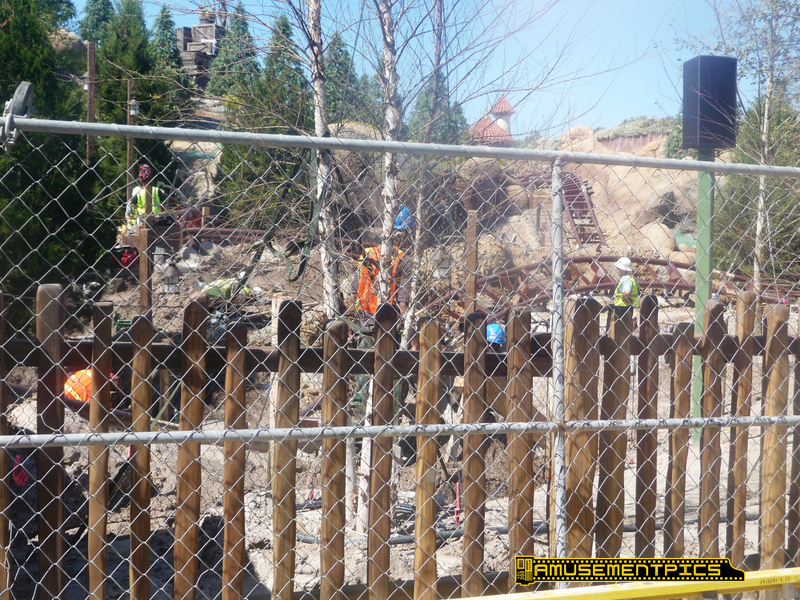 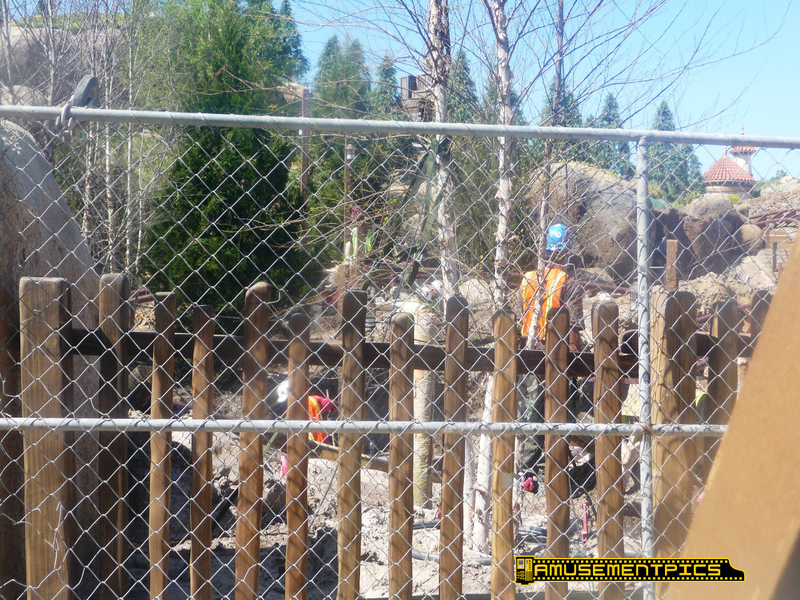 Seven Dwarves Mine is coming along nicely as opening fast approaches. 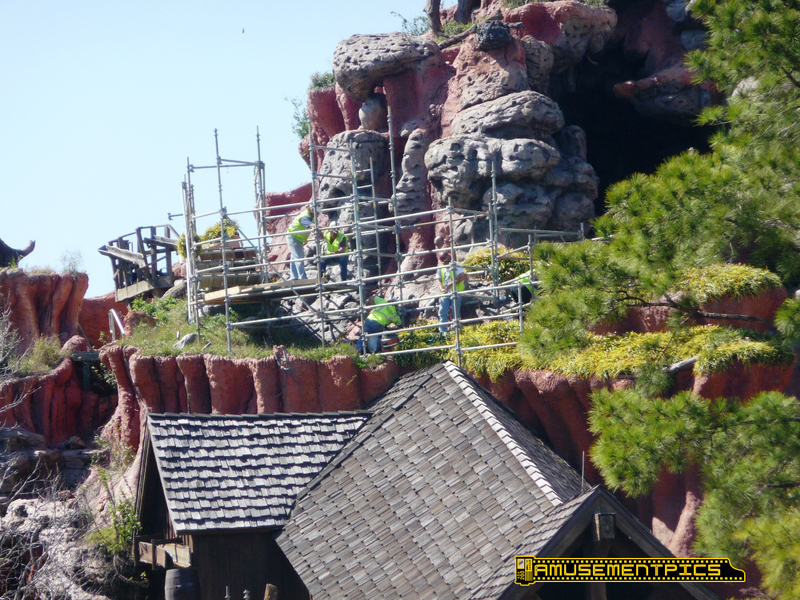 Lots of workers all around the site. Little mine shaft/mine car near the top of the hill. 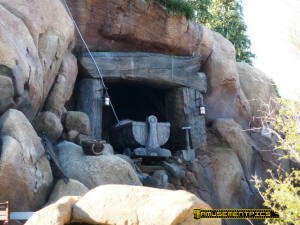 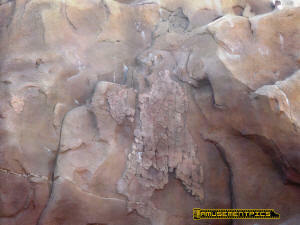 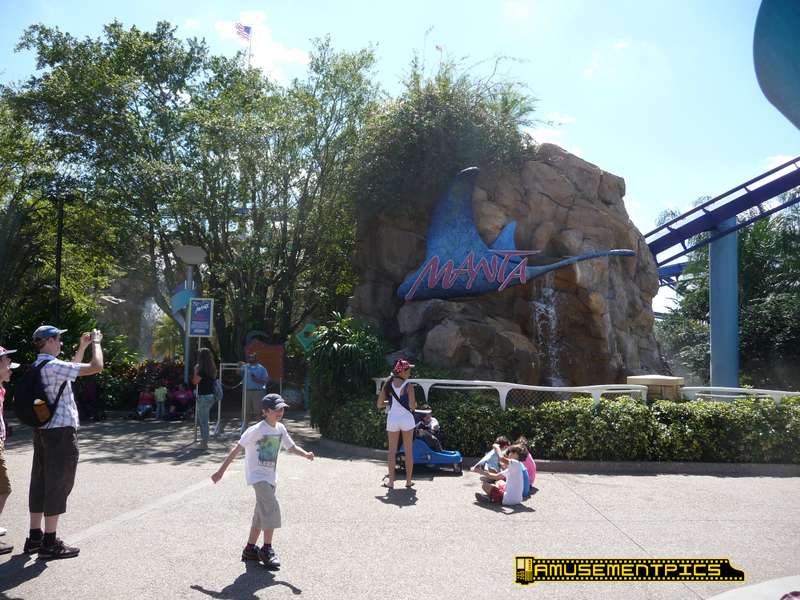 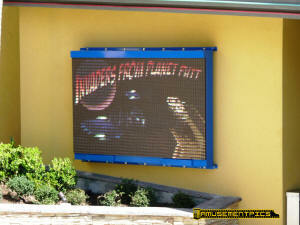 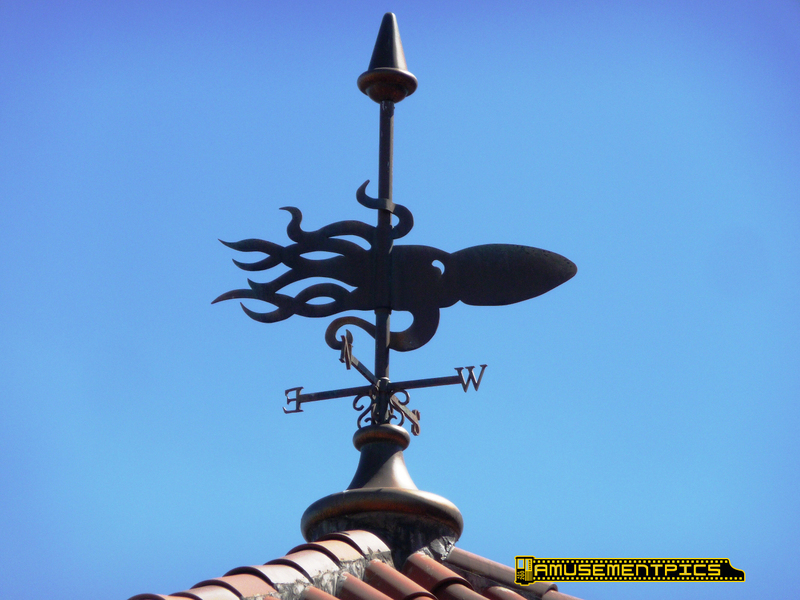 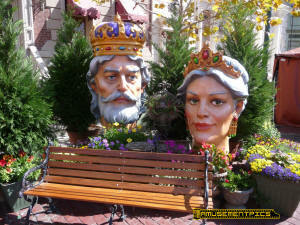 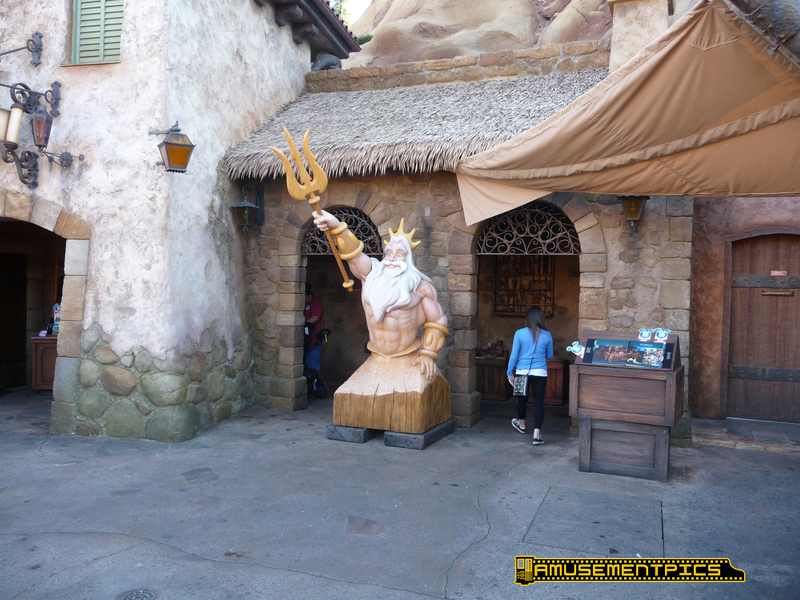 New bust of King Triton on display around the back of the ride. 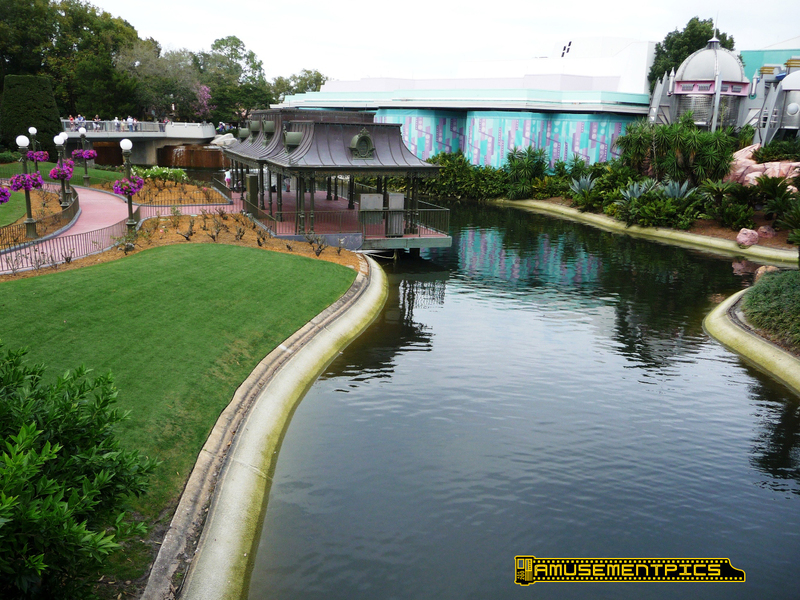 Some missing and faded grass on top of the Little Mermaid facade. The ride is looking good. 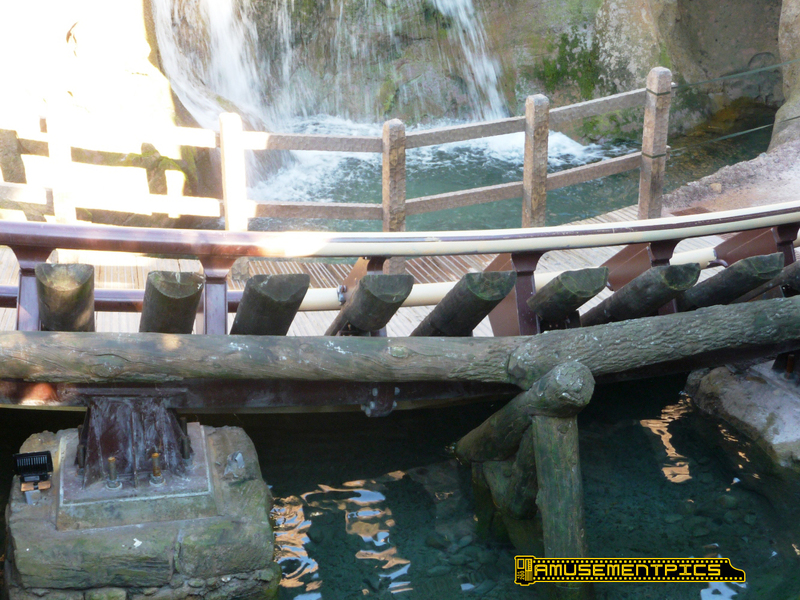 The bridge is a nice touch. nice additions, along with all the trees, adding a nice feeling of nature. 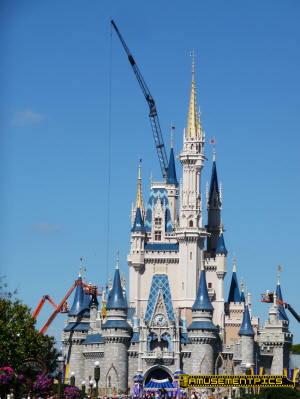 coming down soon. 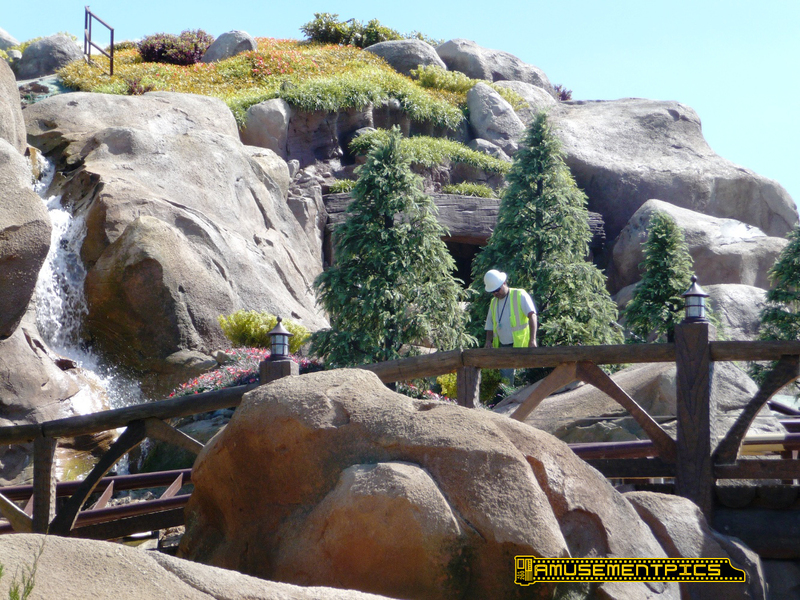 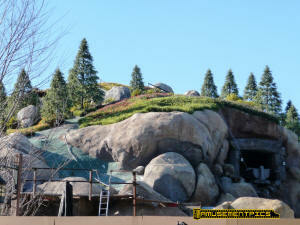 The workers are installing more grass and flowers all around the hill. 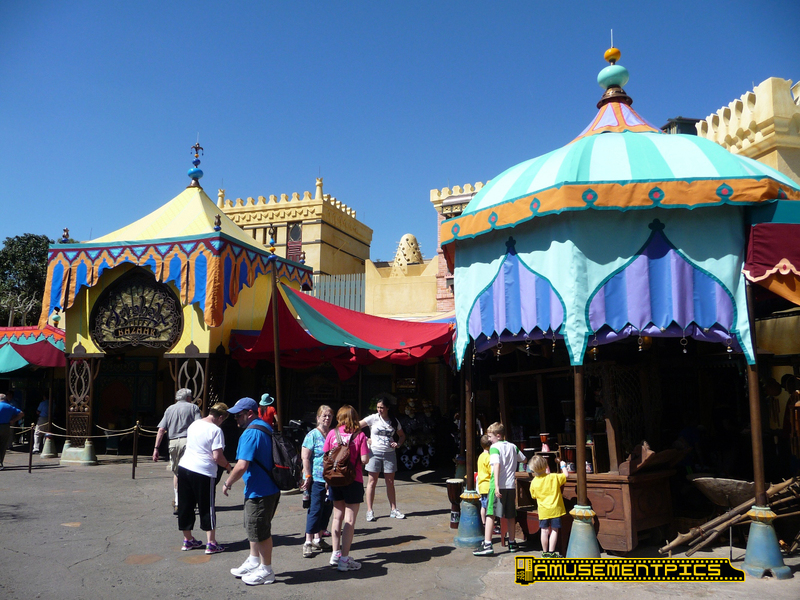 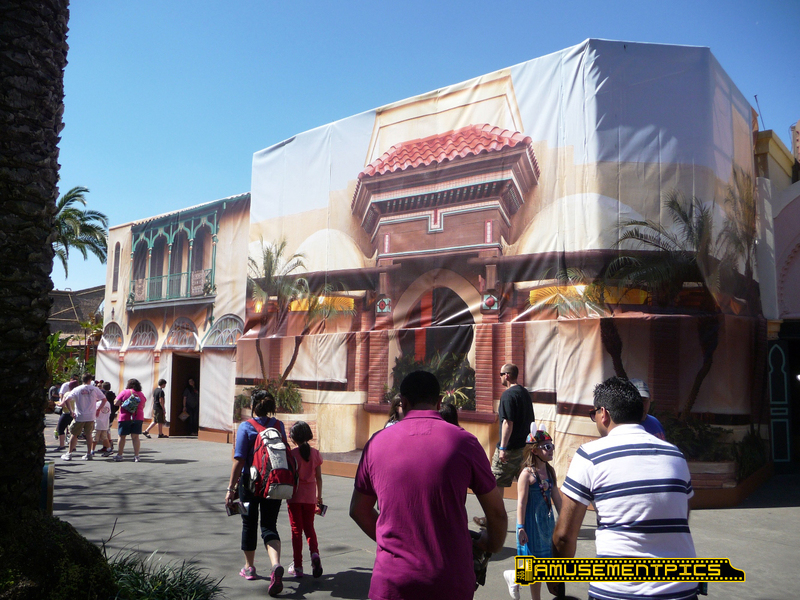 rehabbed in Adventureland. 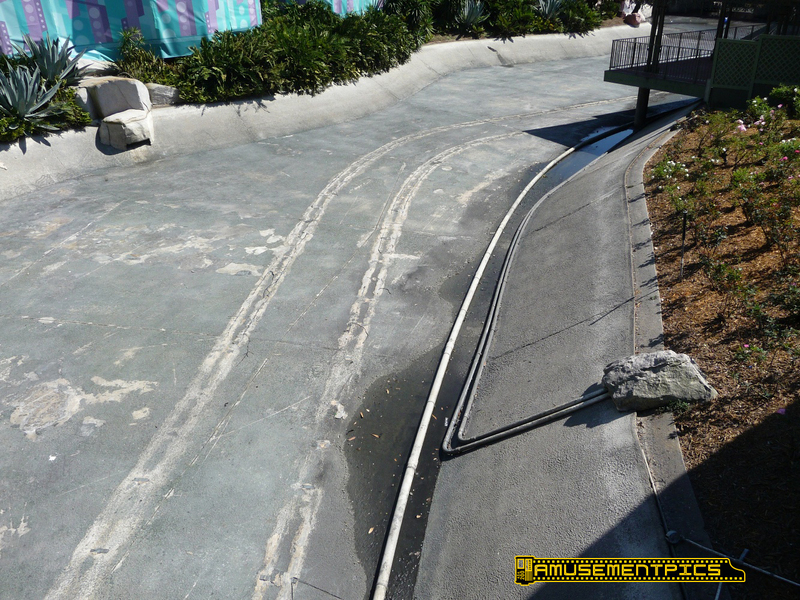 This section just came out of wraps. 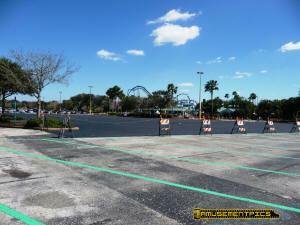 dead end worse than usual. 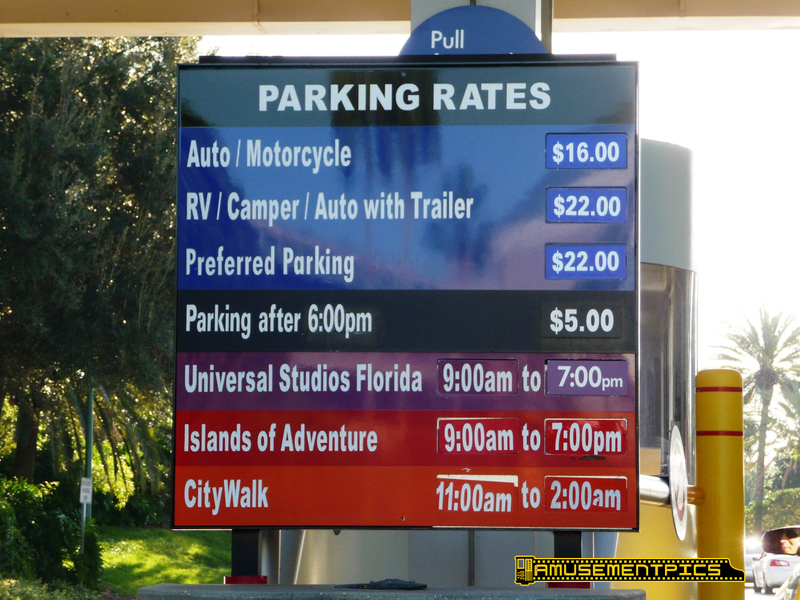 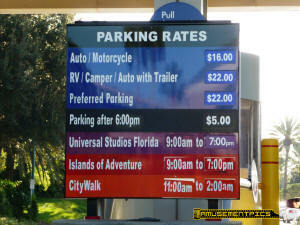 Universal has the highest parking prices in Orlando (for now). 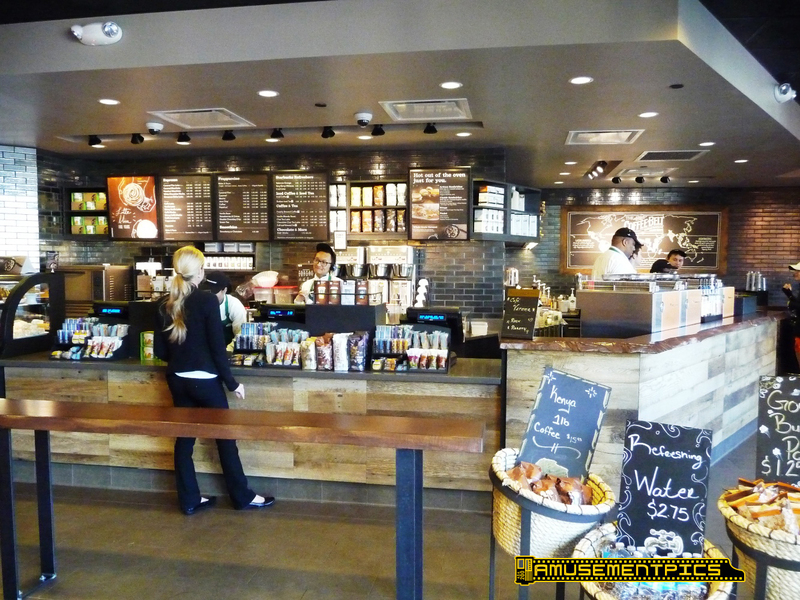 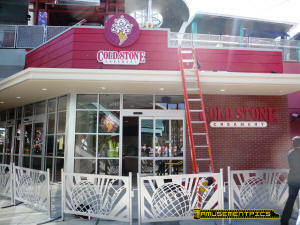 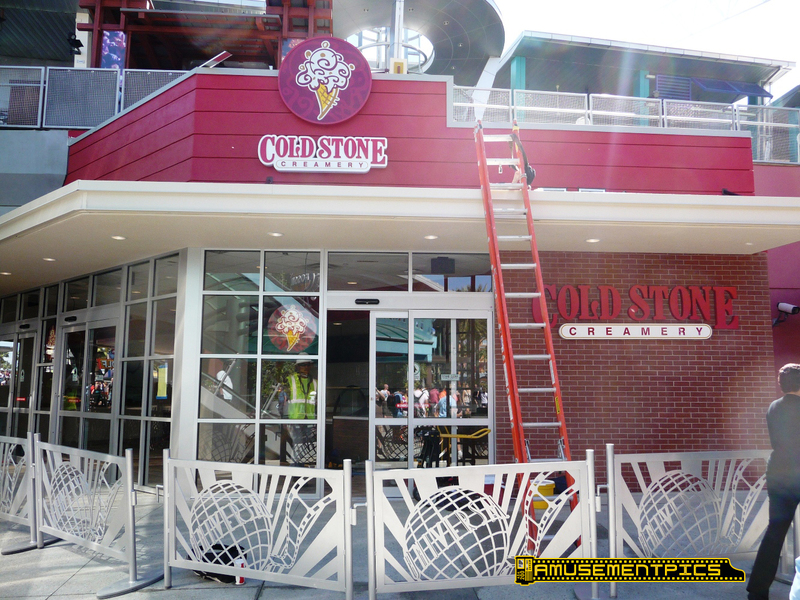 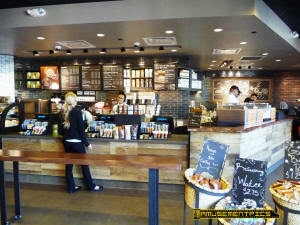 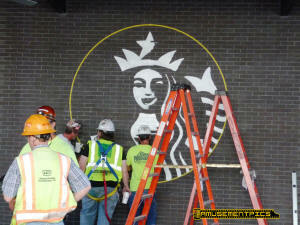 The new Citywalk Starbucks looks nearly ready to open. 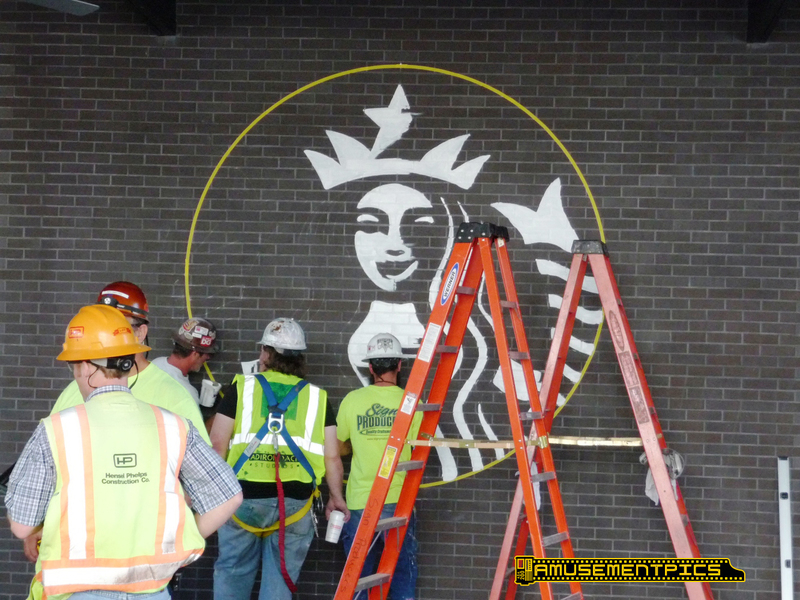 They were painting the logo today. 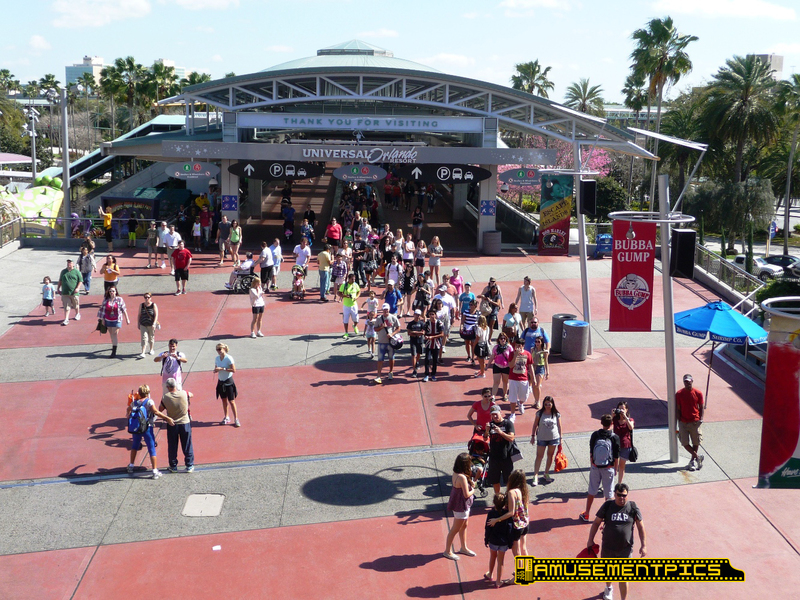 still busy at all the parks. 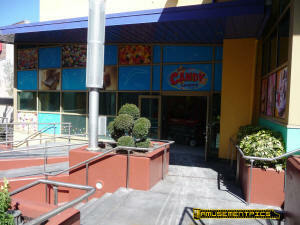 The candy store, TCBY and Cigars have all been gutted in preparation for the new offerings coming this summer. 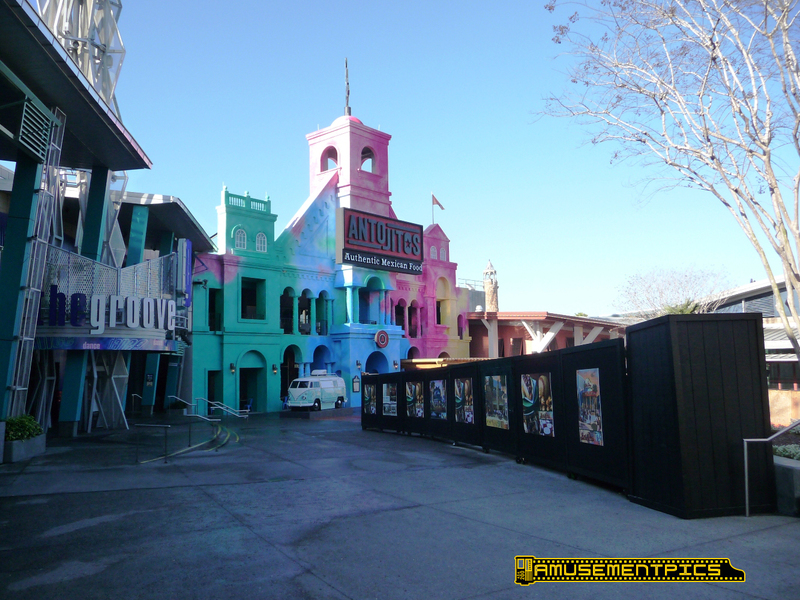 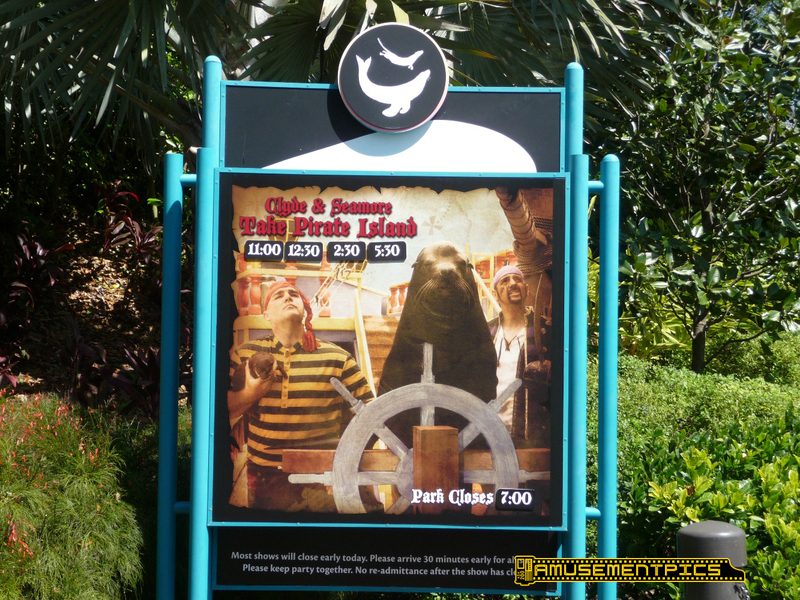 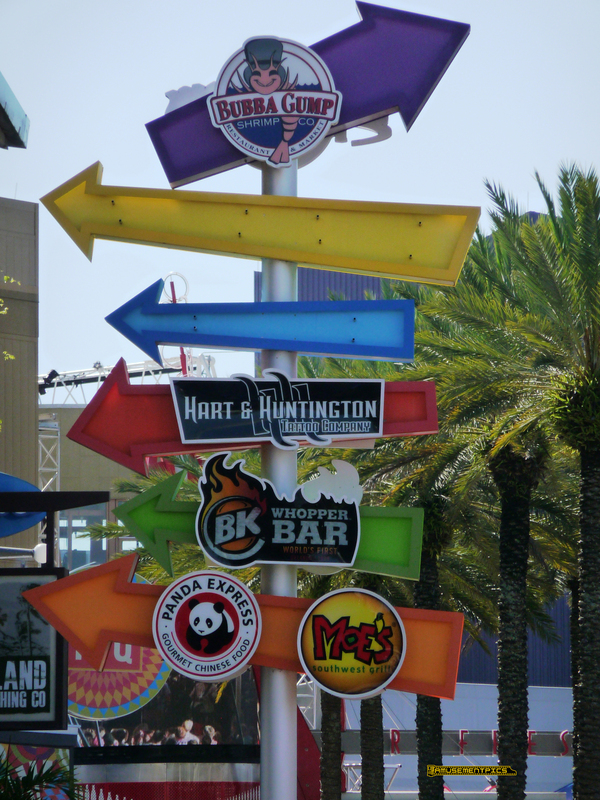 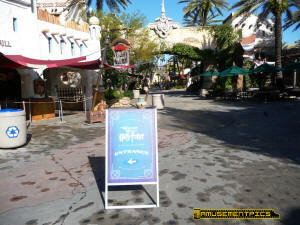 With all the changes on Citywalk, the directions signs have been updated, but expect to see them updated again very soon with all the new places opening in the coming months as things go into high gear for the June opening of Wizarding World in Studios. 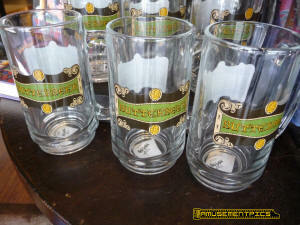 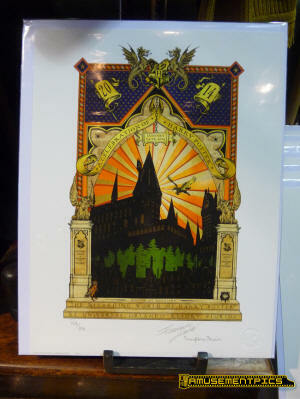 I wonder if we will see Diagon Alley prints coming to this collection? 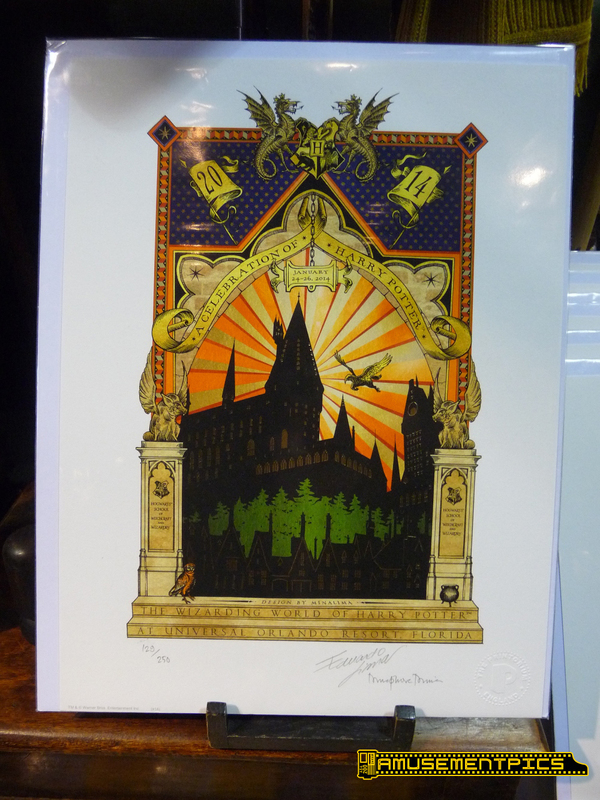 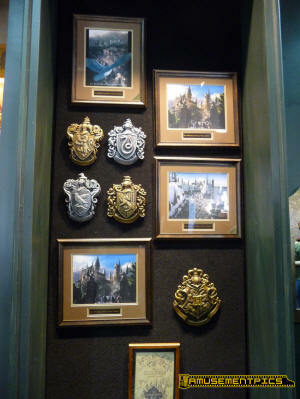 There are still a few of the limited edition prints from the Harry Potter Celebration available in the gift shop. 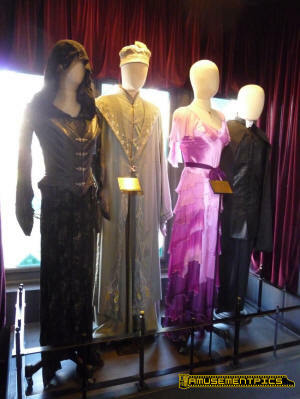 Bellatrix LaStrange and Snape outfits have been added to the high end costume sales display. 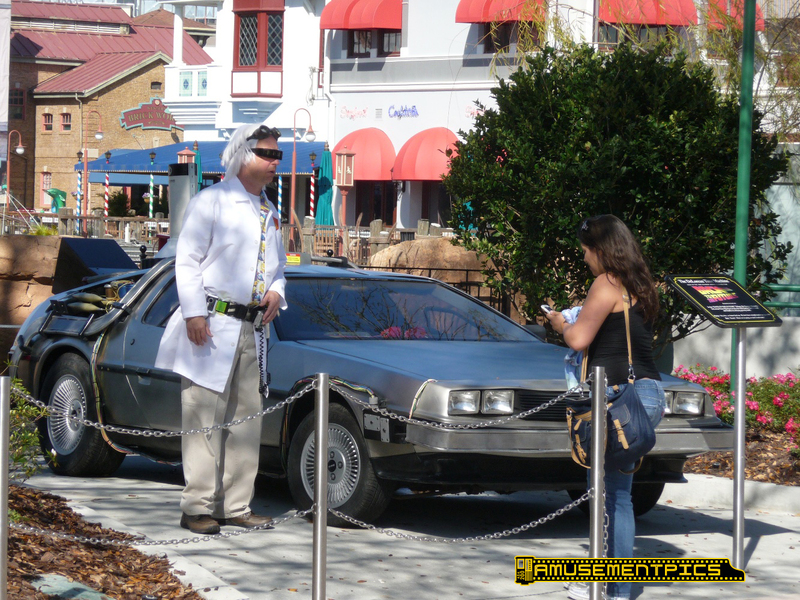 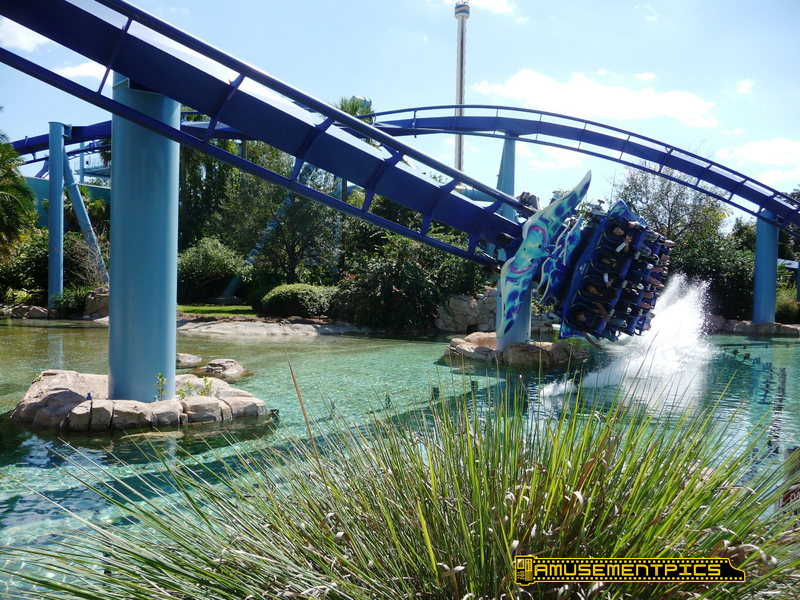 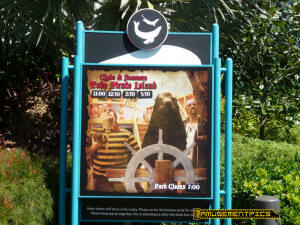 at Islands of Adventure. 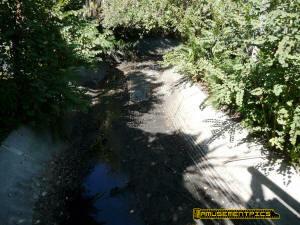 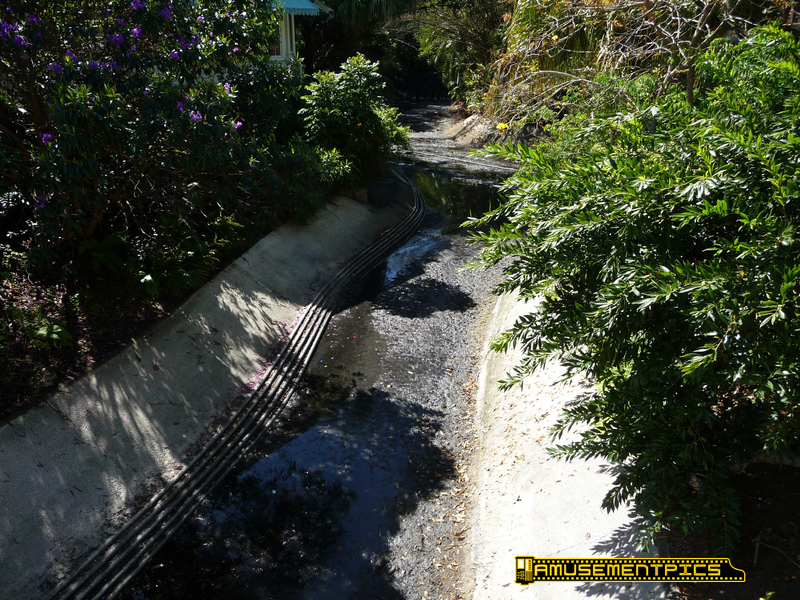 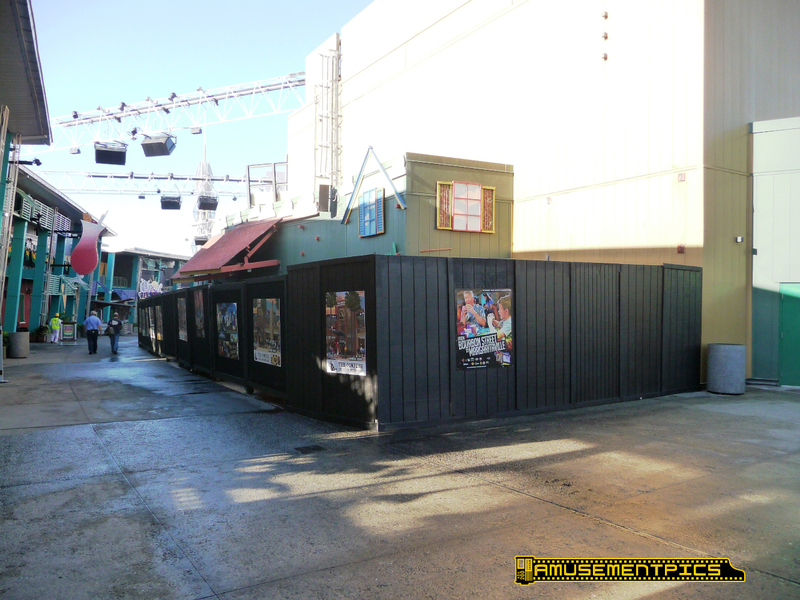 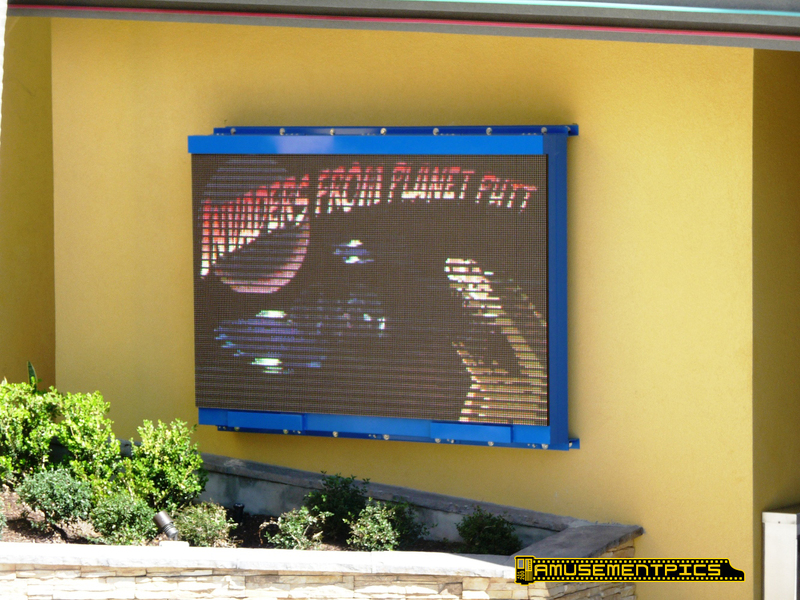 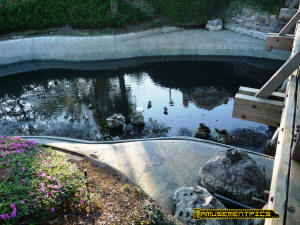 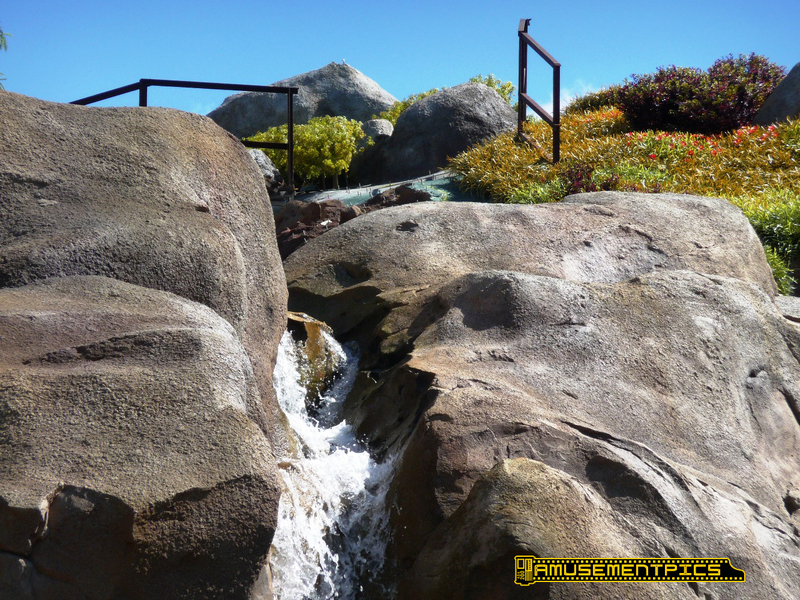 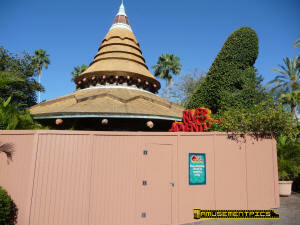 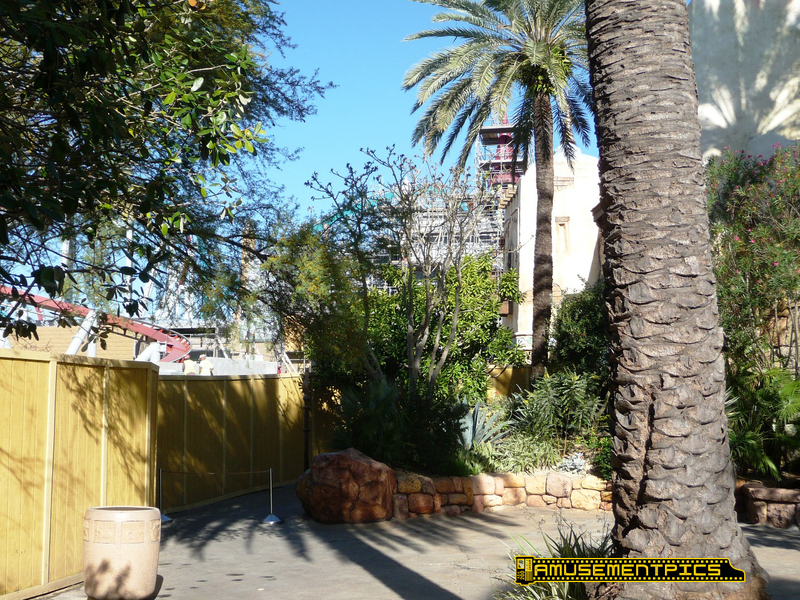 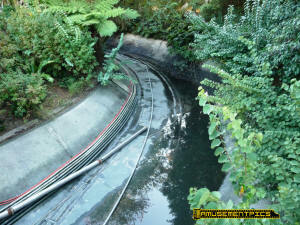 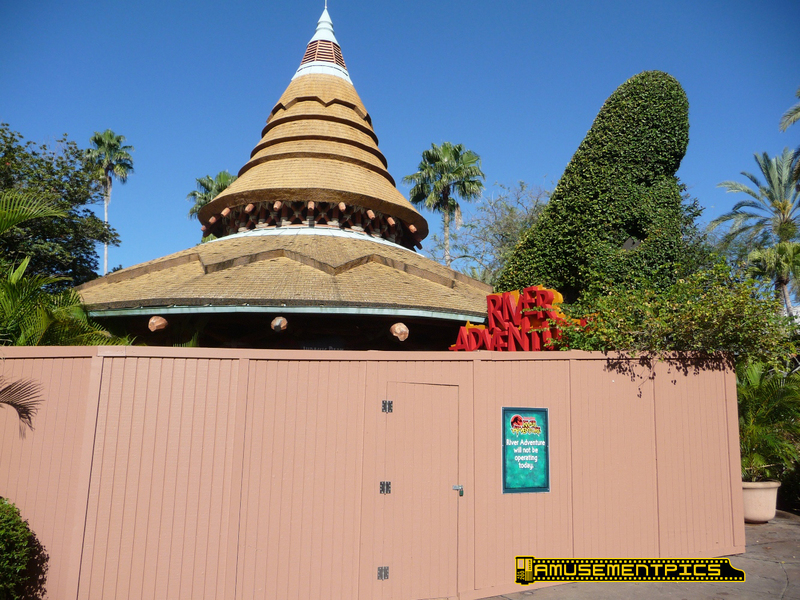 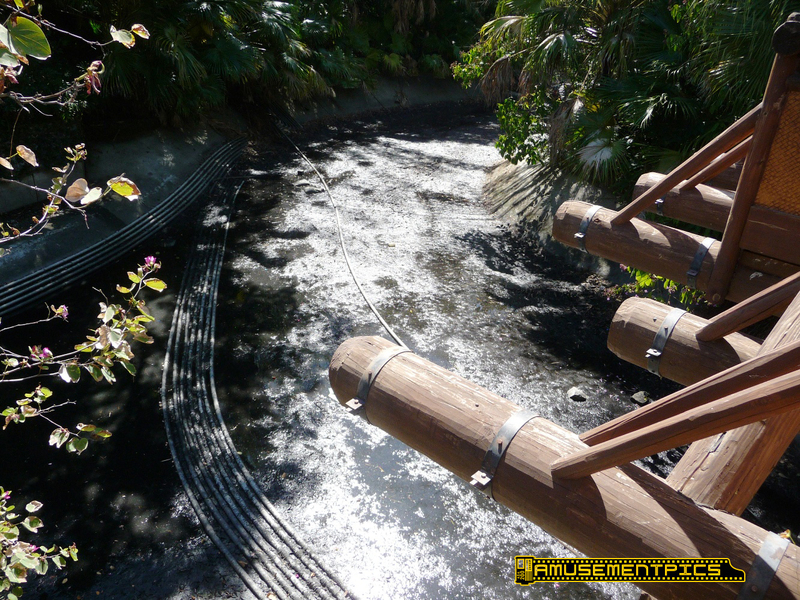 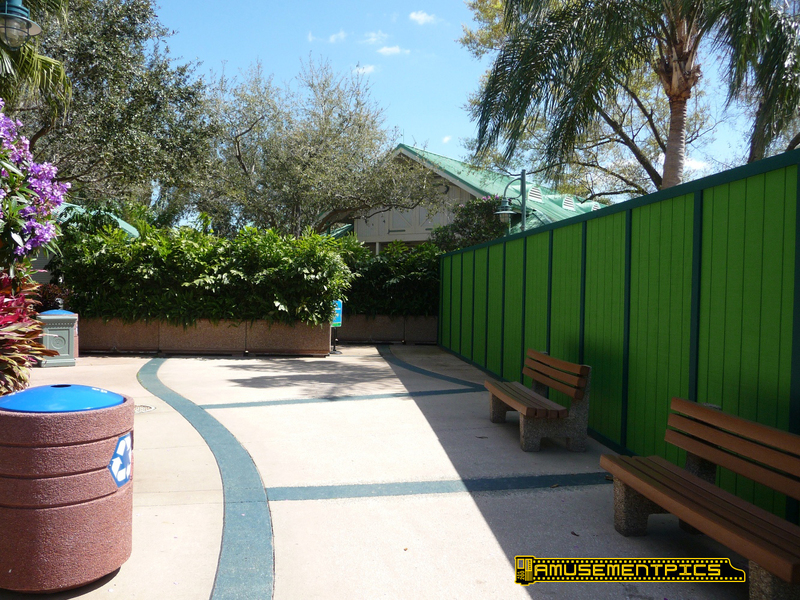 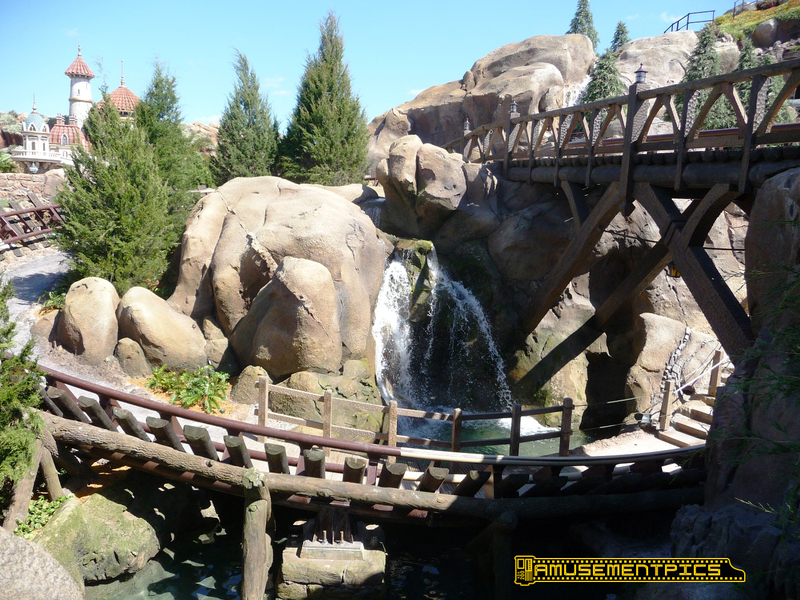 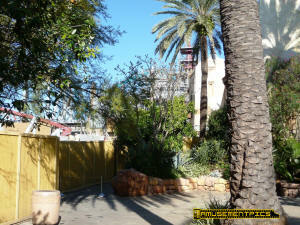 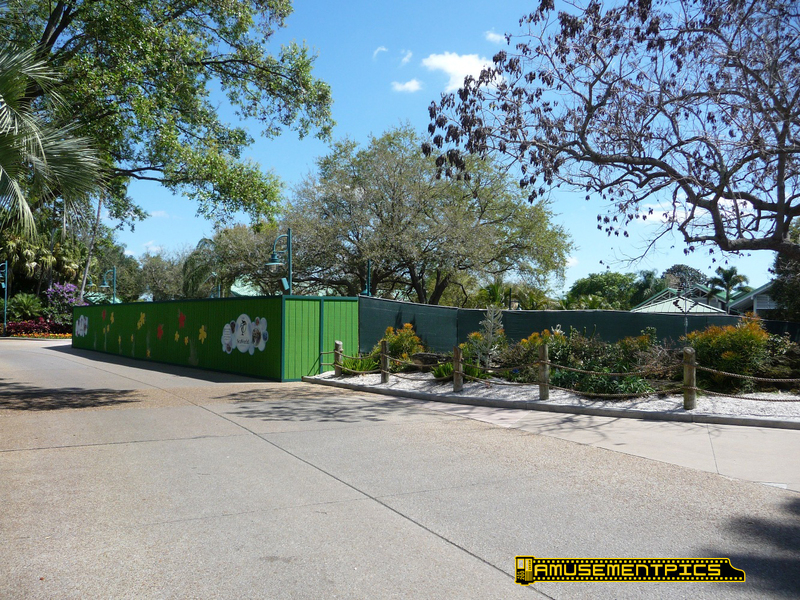 Jurassic Park River Adventure is down for its annual rehab. 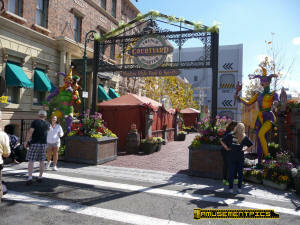 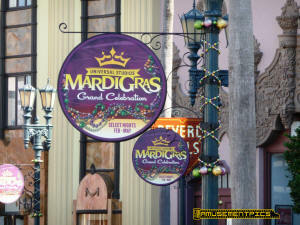 It's Mardi Gras at Universal! 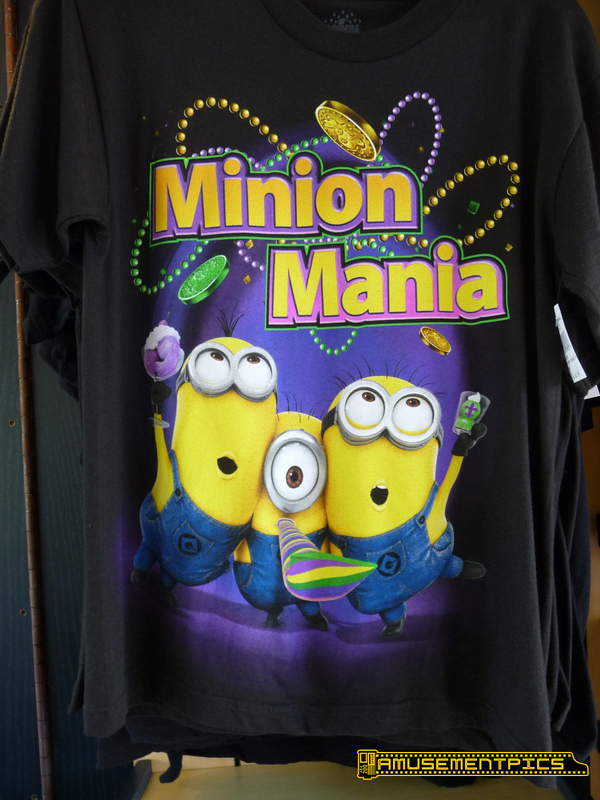 Lots of merchandise available. The entrance to the Courtyard. 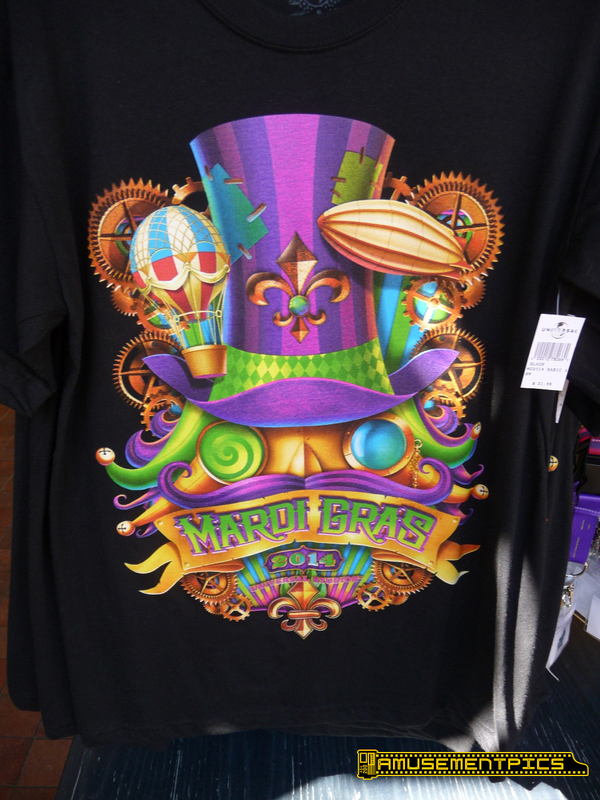 this year's Mardi Gras event. 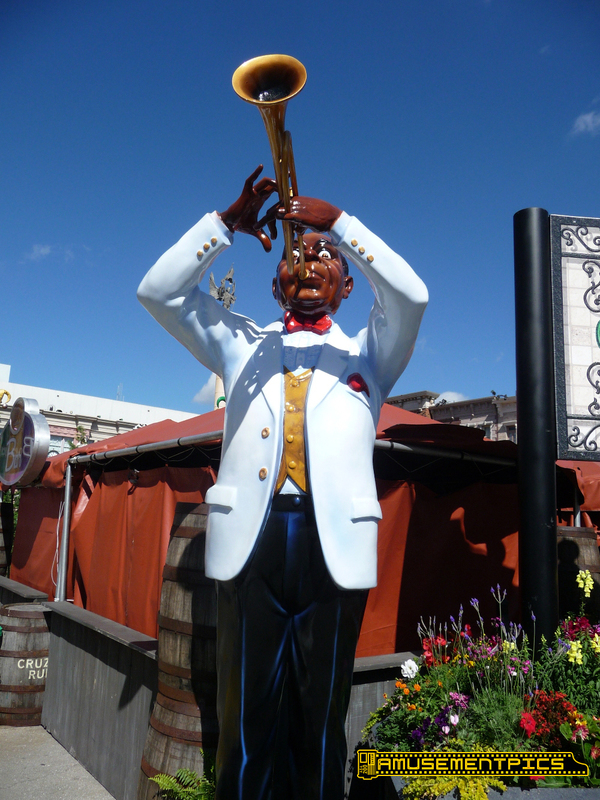 Trumpeter statue at the entry. 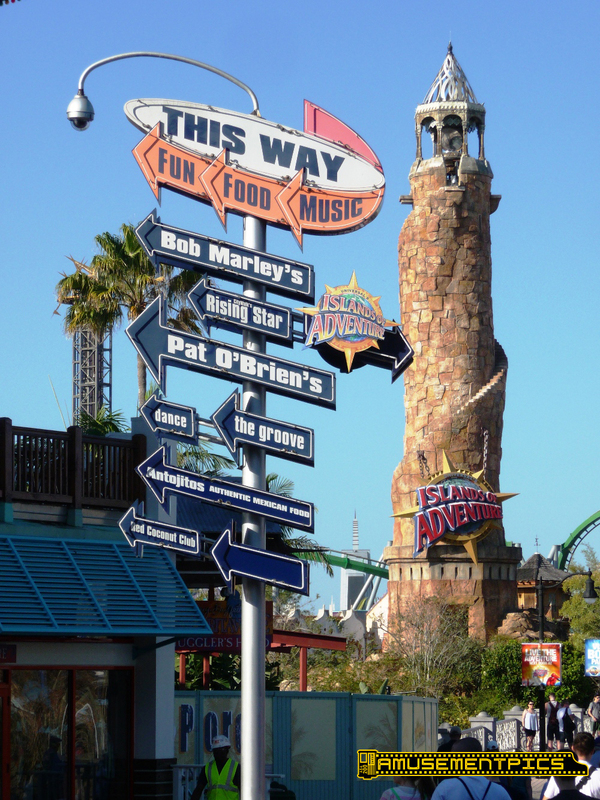 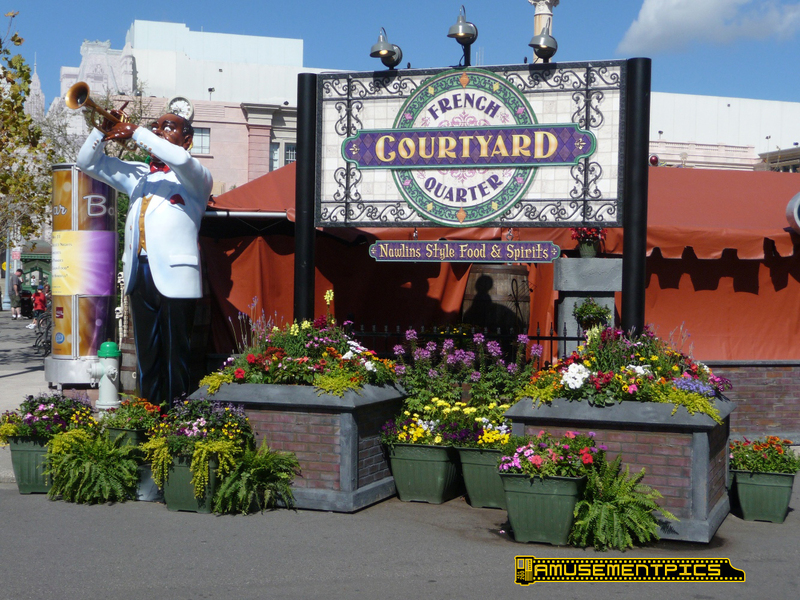 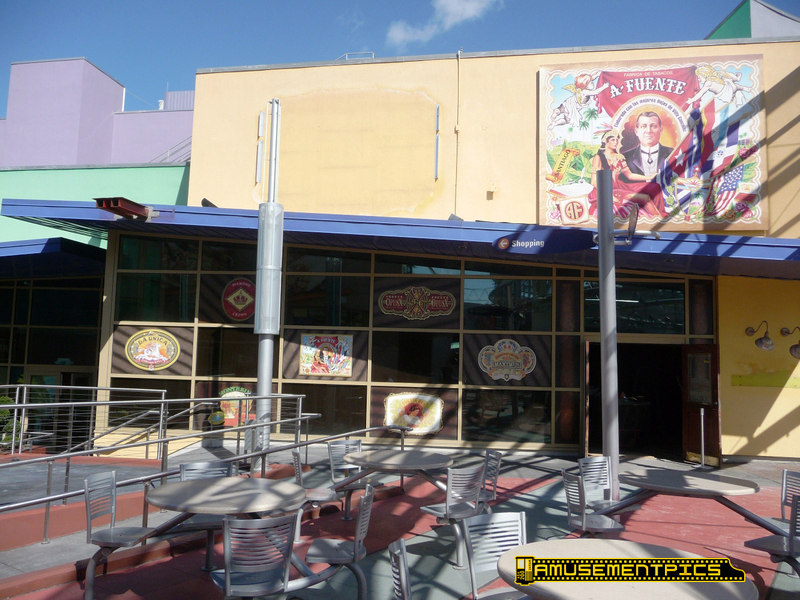 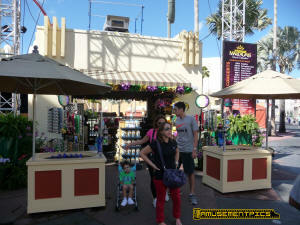 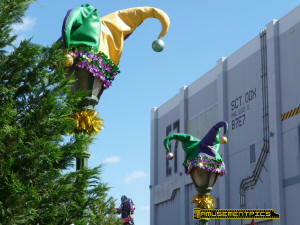 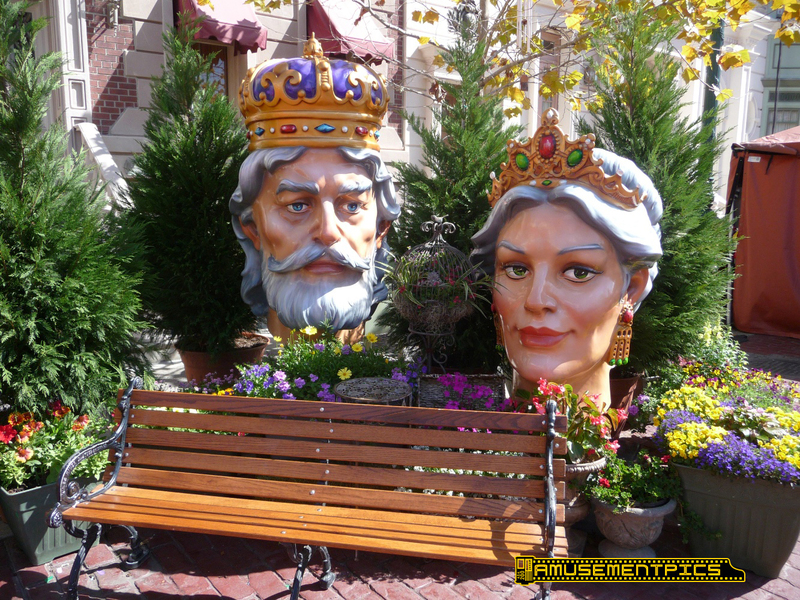 Mardi Gras is always one of the bets times to visit Universal for the music, food, and festivities! 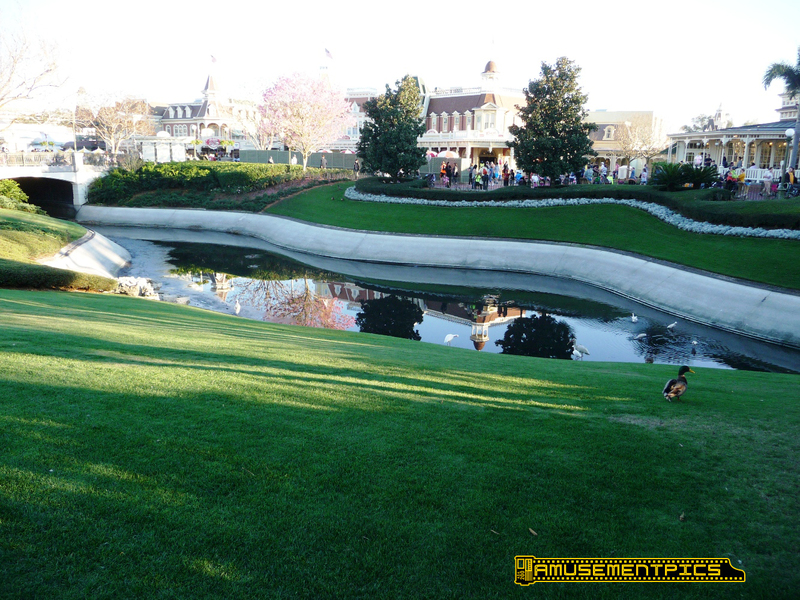 other side of the park. 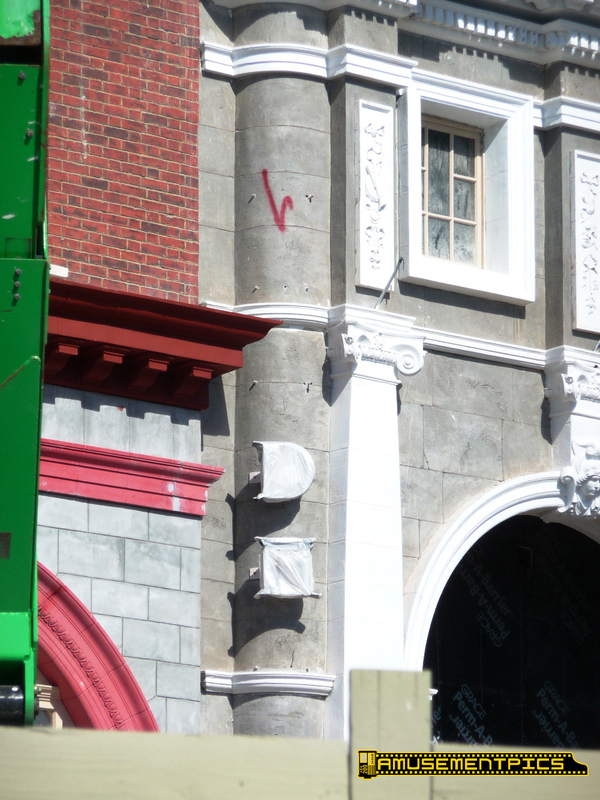 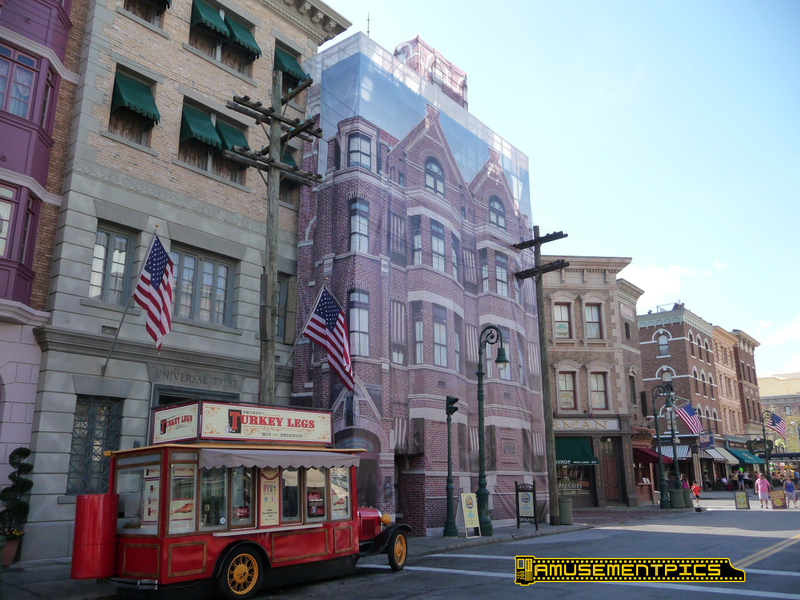 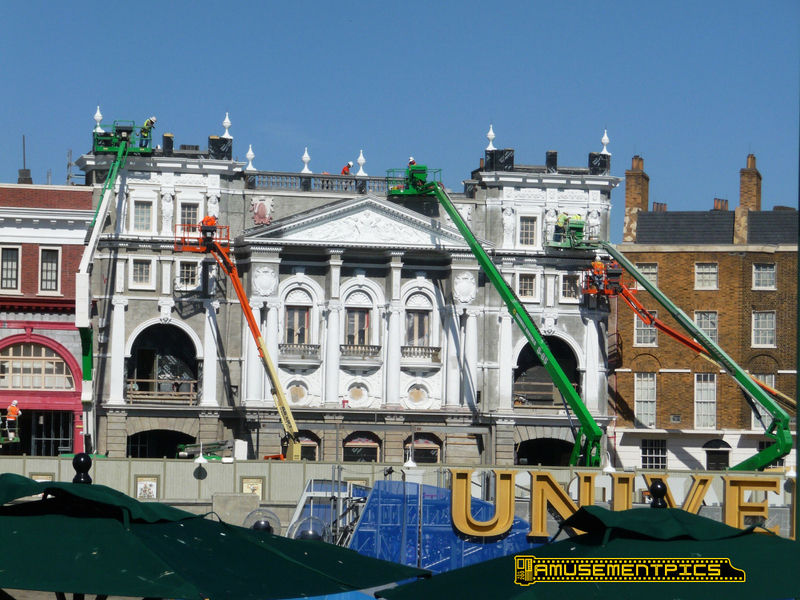 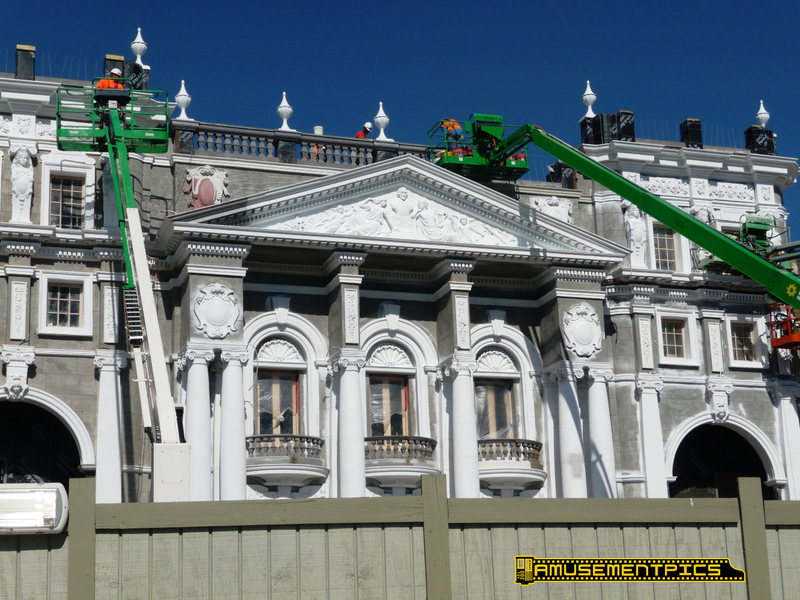 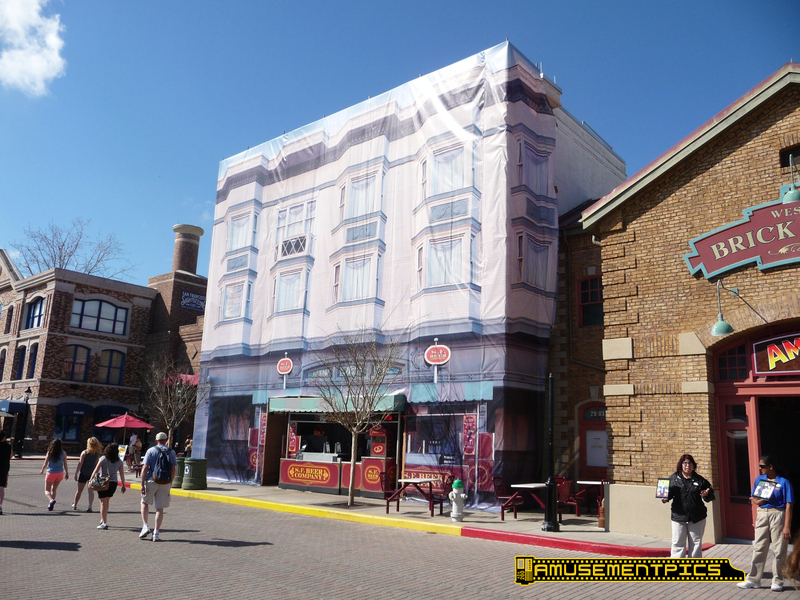 added to the Wyndham's facade. the wrong side of the "D". 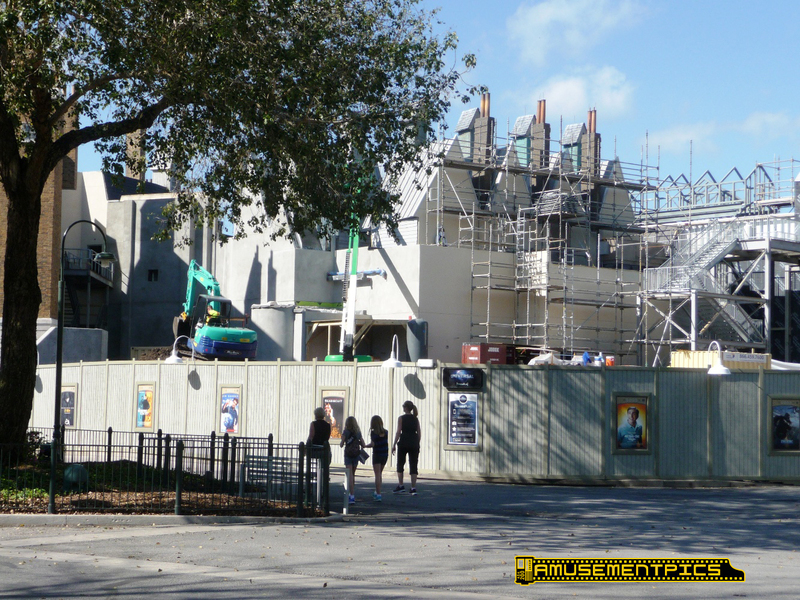 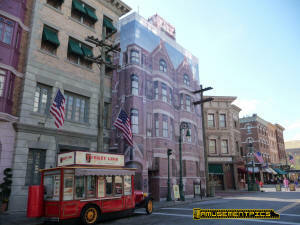 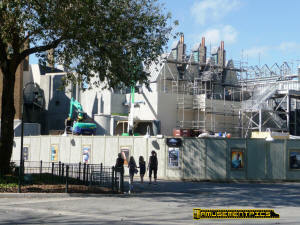 They seem to be building a berm behind the facades. 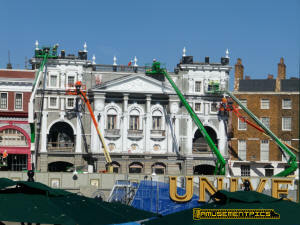 Lots of work on the Whyndam facade. 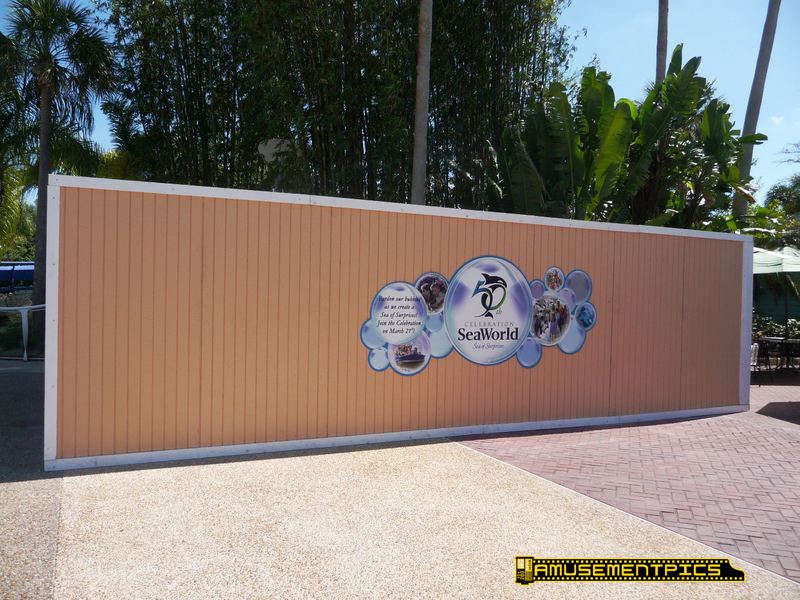 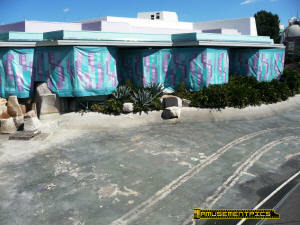 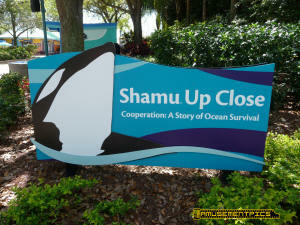 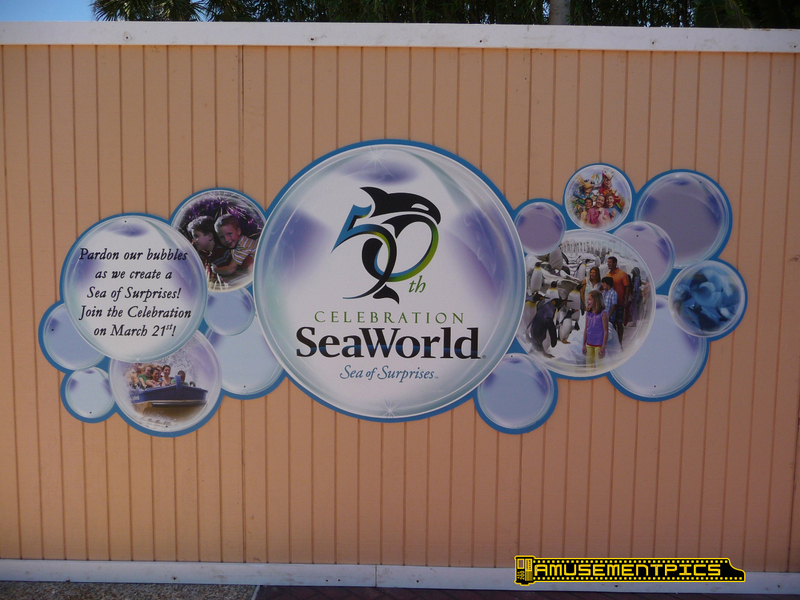 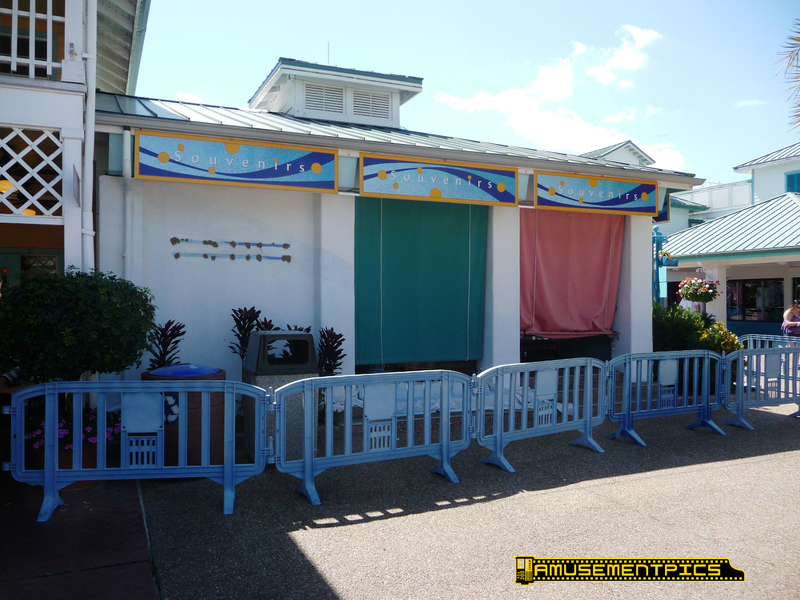 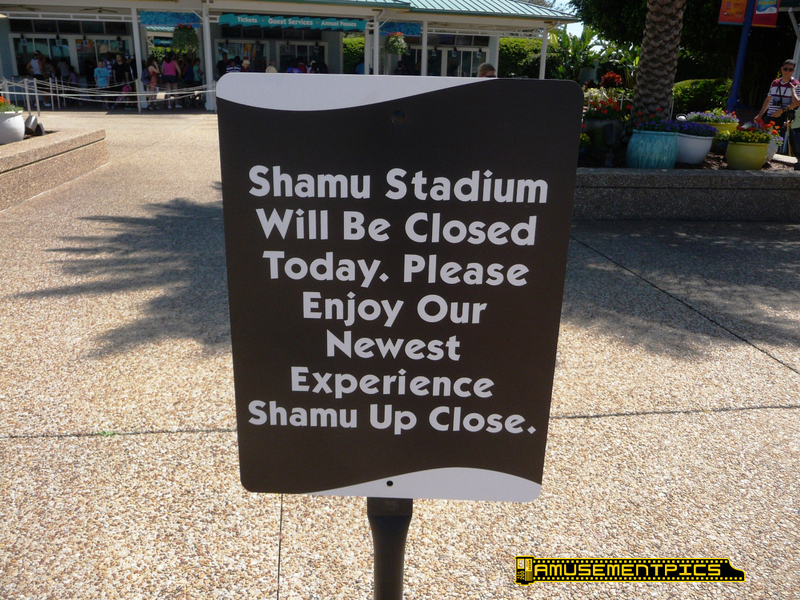 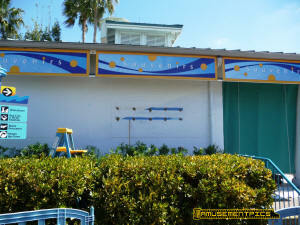 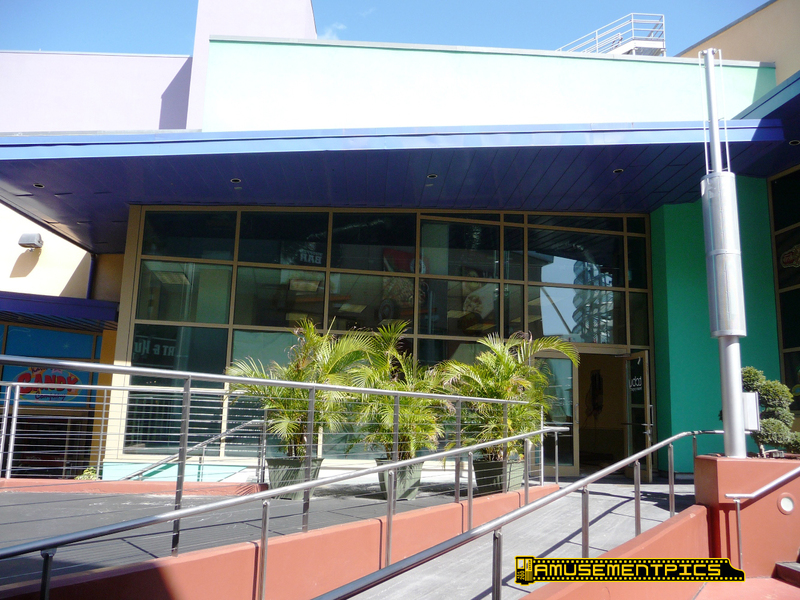 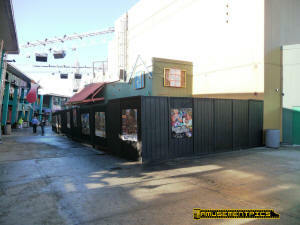 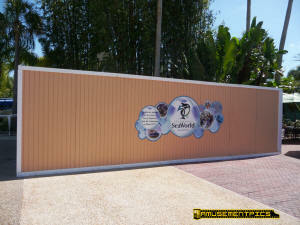 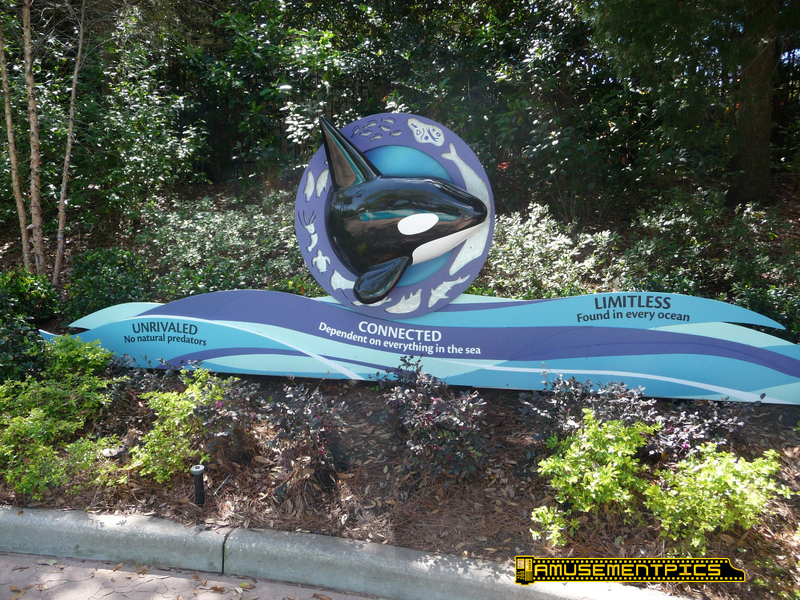 Shamu Souvenirs is closed as it becomes the 50th Anniversary shop. 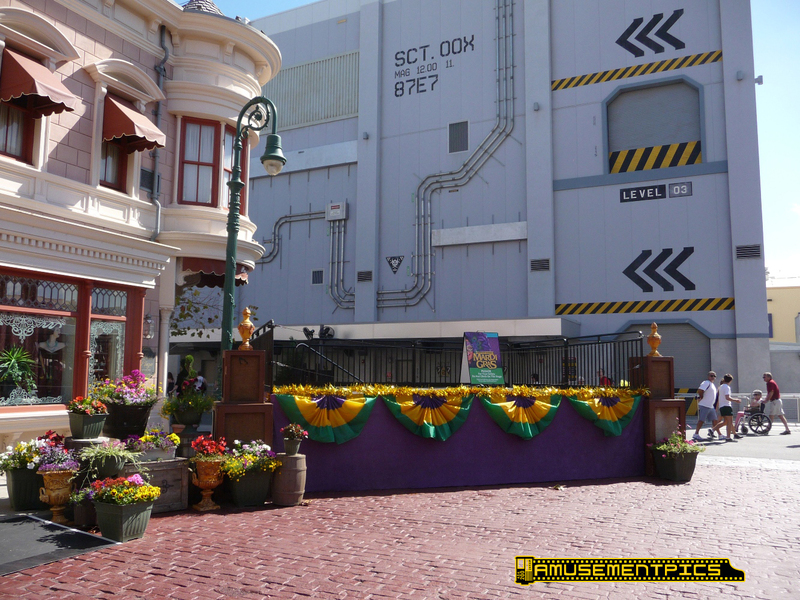 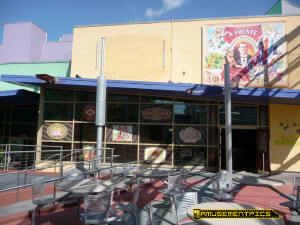 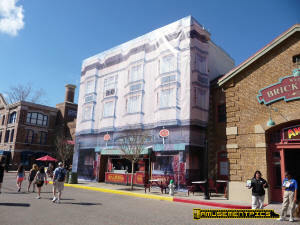 Crews were hard at work inside remodeling in preparation for the March 21st official celebration. 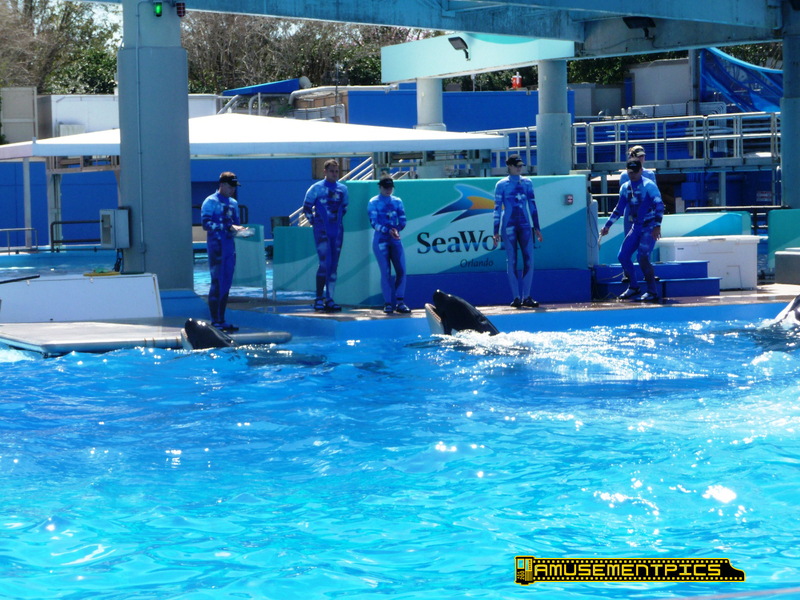 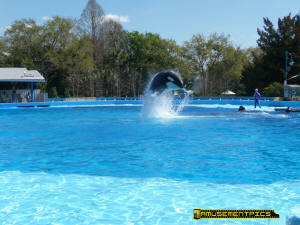 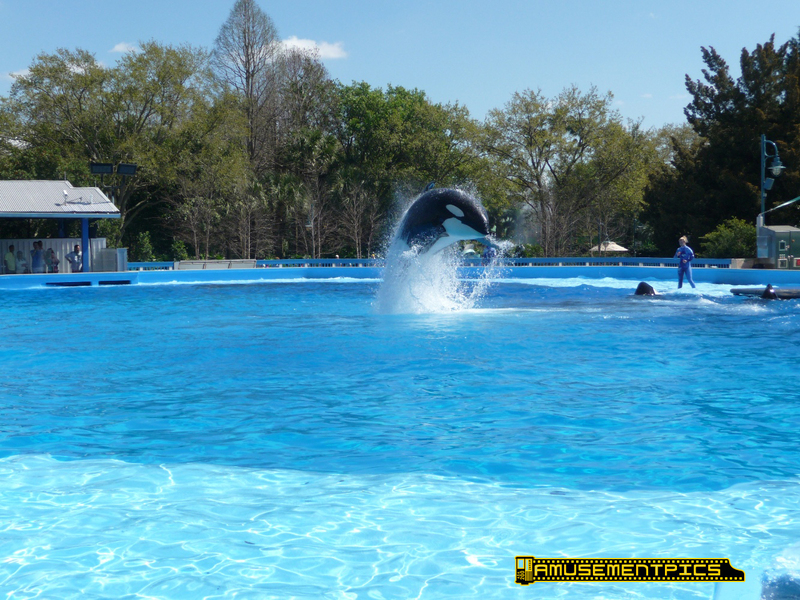 and actually gets guests closer to the orcas than they ever got during the shows. 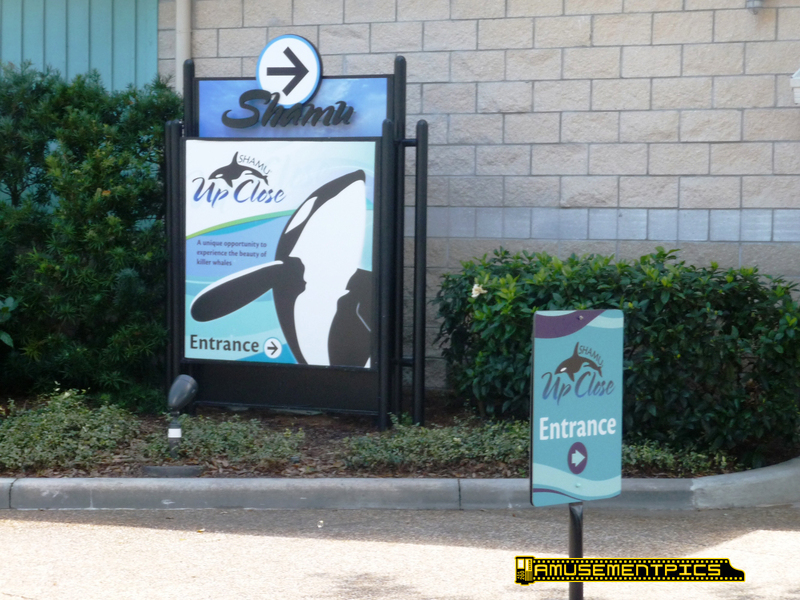 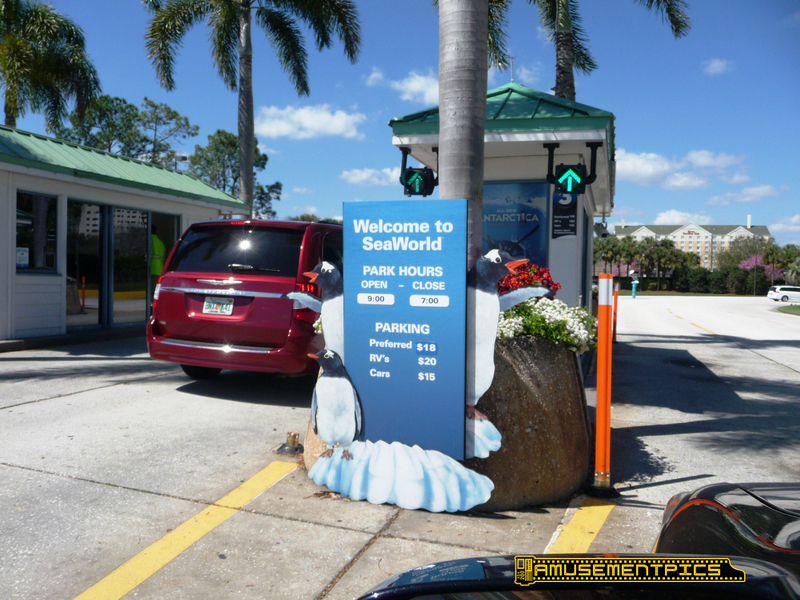 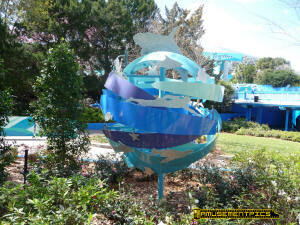 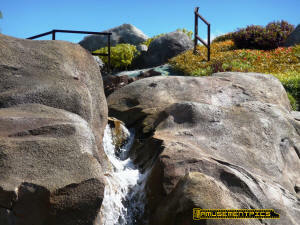 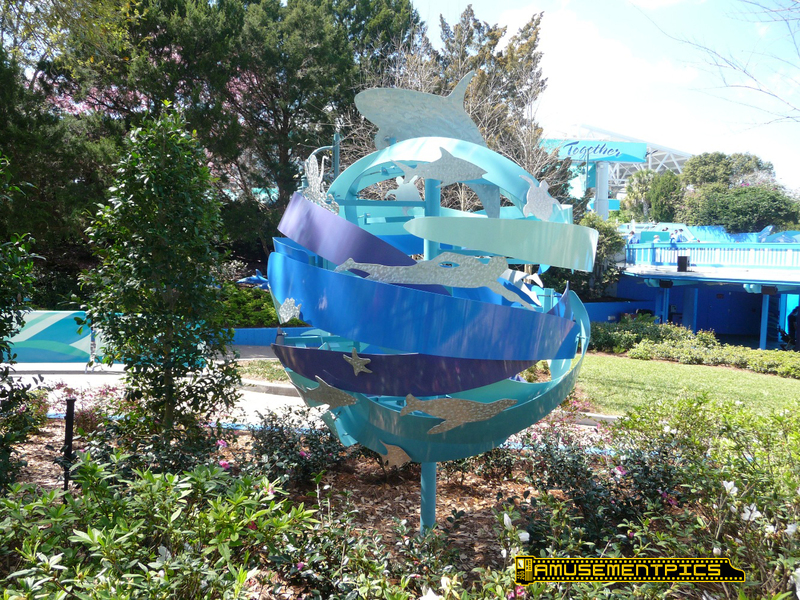 Sculpture and displays at the exit from the Shamu Up Close area. 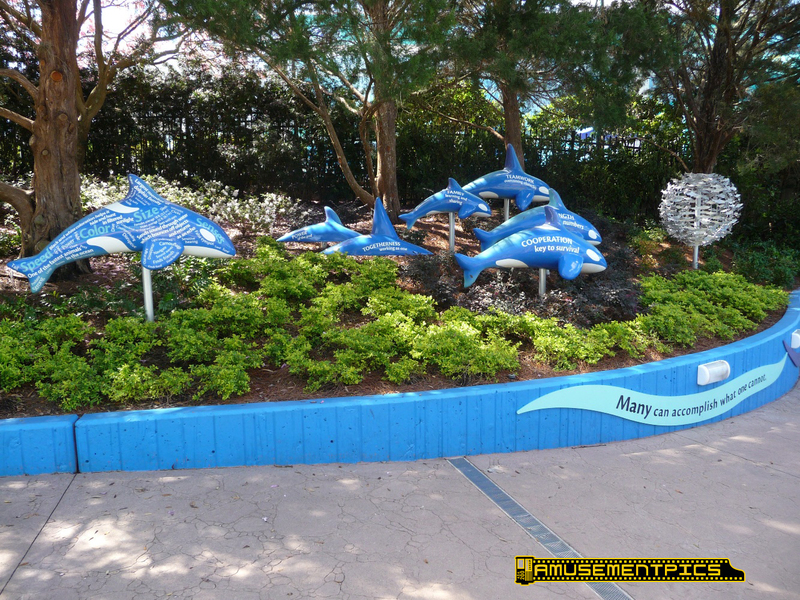 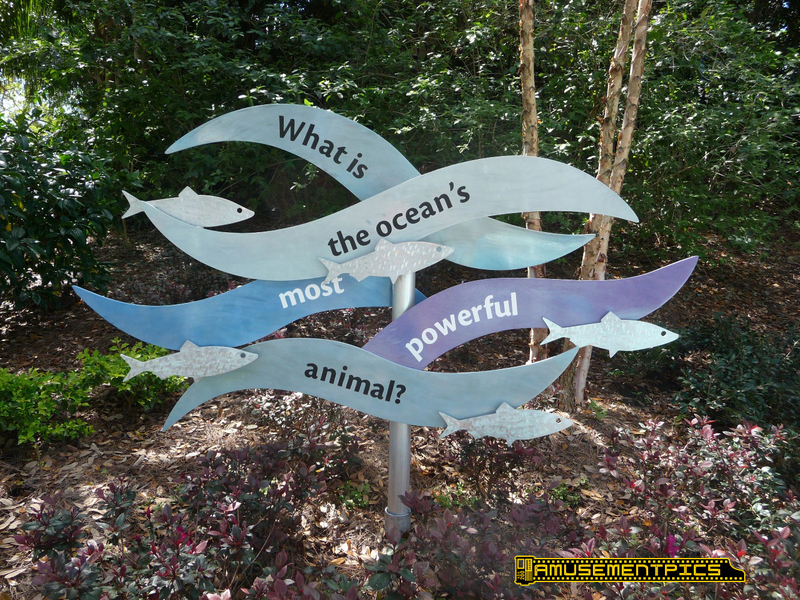 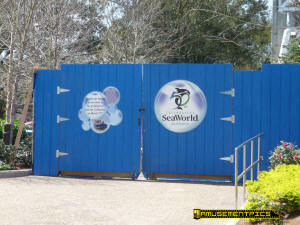 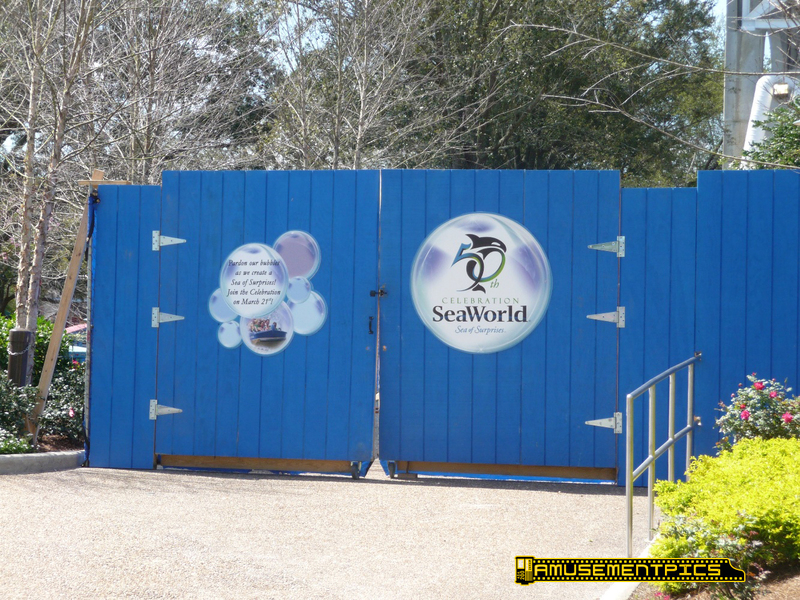 an educational exhibit about SeaWorld's Rescue program. 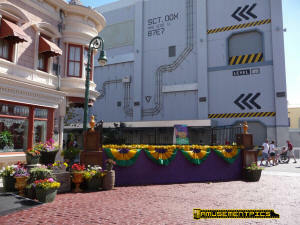 and then an operational glitch yesterday.